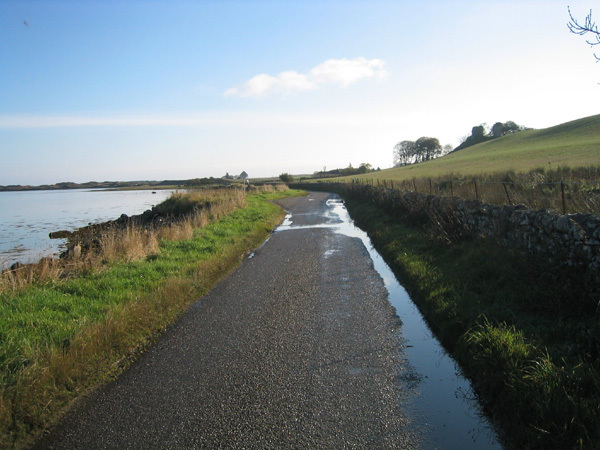 Results from the ROADEX project have shown that the lifetime of paved roads can be substantially increased by ensuring that the drainage system functions correctly. Good drainage management has also been proven to be the most cost effective measure for dealing with permanent deformation, and/or problems with road condition management in general. For this reason drainage should always be given the highest priority possible when selecting maintenance and rehabilitation measures. 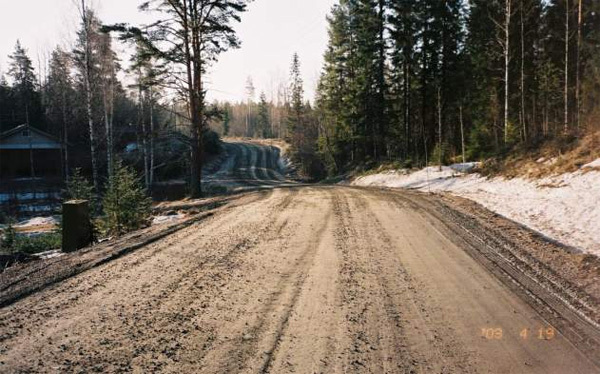 Results from the ROADEX project confirm that this general rule can be applied to all roads: paved, gravel and forest roads. 3. The preparation of a drainage rehabilitation, and/or maintenance plan, including definitions of the expected maintenance standards.. 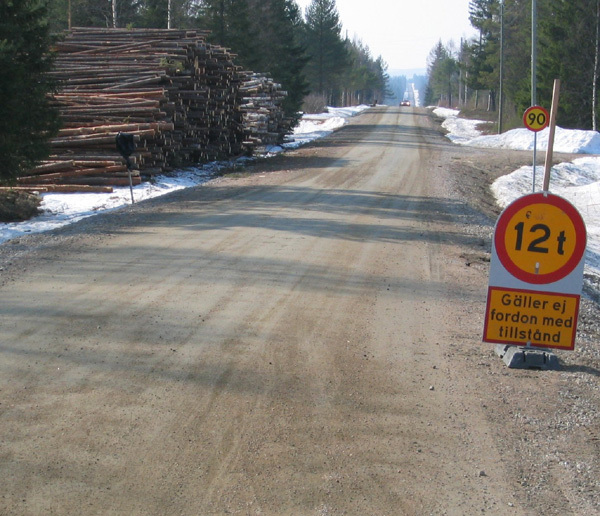 Permanent load restrictions are normally used on a road when it is considered that the road will not have sufficient construction to carry the expected heavy traffic other than when it is frozen during winter. The aim of permanent restrictions is to reduce imposed stresses on road structures, and the risk of permanent deformations. This protects the road, but has the downside of creating obstacles to the economic development of communities served by the road. 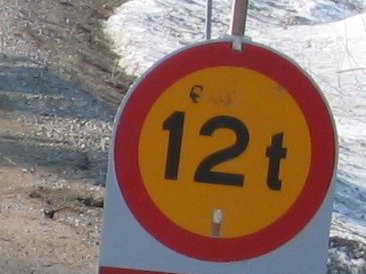 Temporary weight restrictions are used in most areas where the road structure is frozen for at least part of the year. 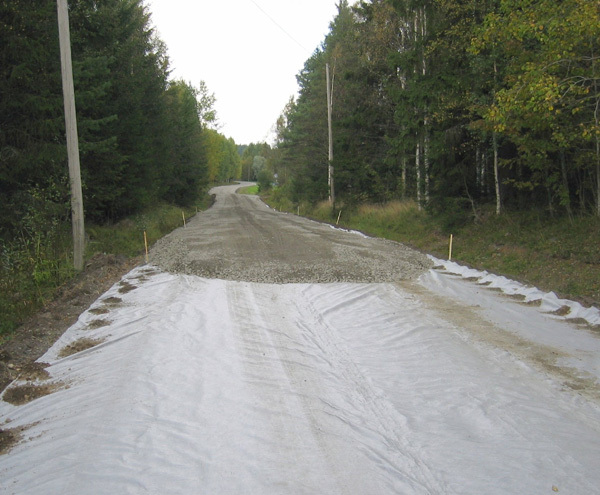 During the critical seasons, when the bearing capacity of the road is at its weakest, many weak low volume roads need protection. Examples of this can be found in Scandinavia, Russia, northern China, Canada and the northern U.S.A. Scotland also uses temporary weight restrictions. 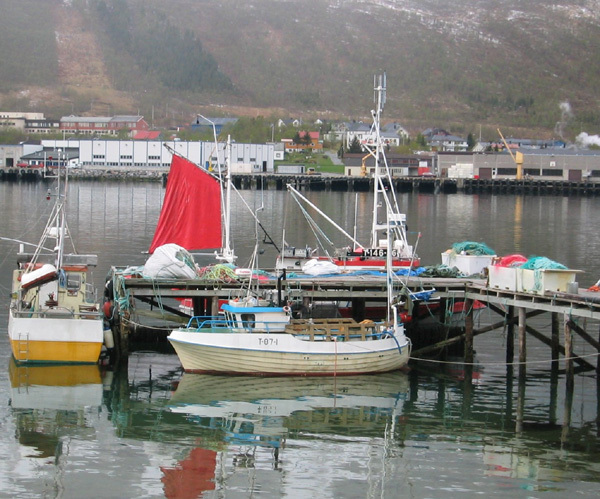 Norway is an exception to this general practice. Temporary weight restrictions have not been permitted there since 1995 and only permanent weight restrictions are used on weak roads. 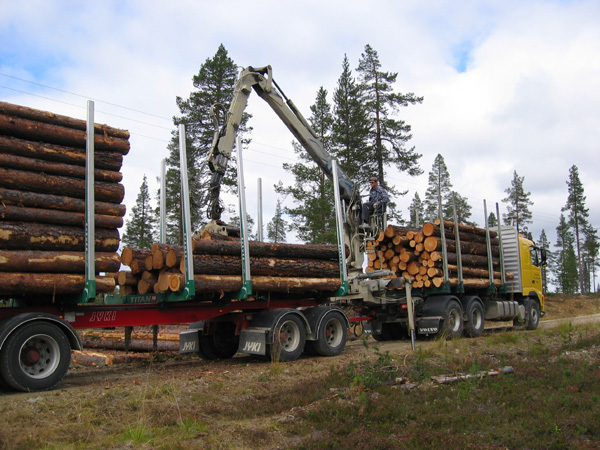 Heavy transportation industries are now important economic drivers for rural areas, particularly those of the forestry and fishing industries, and as a result roads organisations are coming under increasing pressures to lower the number, and duration, of their temporary weight restrictions. Recently the USA and in Canada have started to permitting higher axle loads in winter using winter premiums. 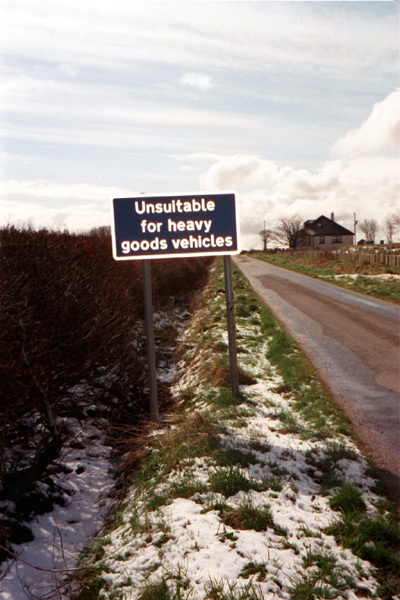 When road organisations are considering applying restrictions the questions normally asked are: a) What are the roads/road sections should be restricted? b) Is there a need for a temporary load restriction every year? c) When it should be applied? d) What is the maximum axle load or total weight that should be imposed? e) When can the load restrictions be removed? and f) How will the loads be monitored during the restrictions? Each country has their own policy and these systems are described in detail in ROADEX reports on Spring Thaw Weakening. The following brief answers can however be given to these questions. What are the roads/road sections should be restricted? Normally the decision on which roads, or road sections, need load restrictions is made based on old experience of the roads, ie. 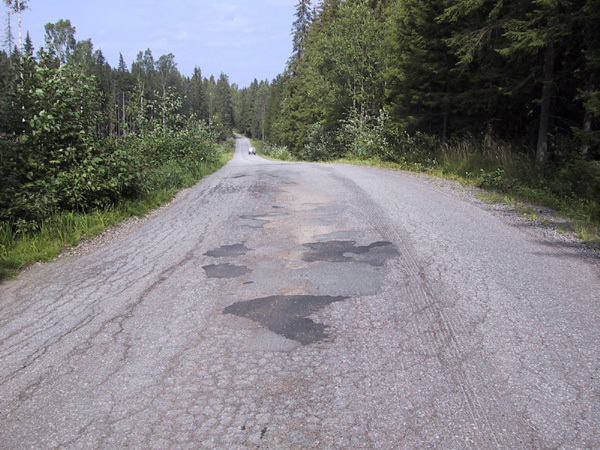 the roads that have suffered from severe spring thaw weakening problems in previous years. This can be ascertained from the spring thaw weakening data base, if such exists. 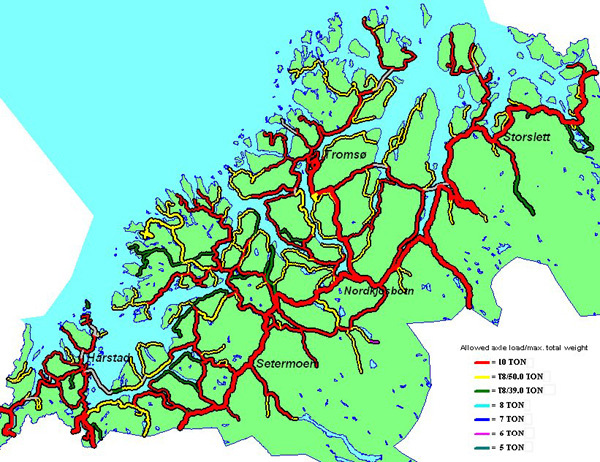 A good example of this is from Finland where the decision on restrictions is normally made based on the severity and repeatability of previous spring thaw problems. 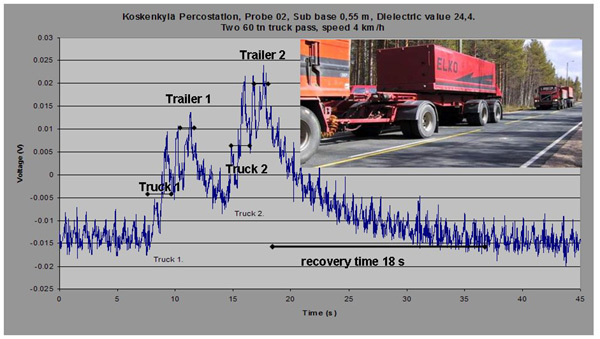 Another way to determine the need for load restrictions is through a risk analysis that has been tested in the ROADEX project. This analysis identifies where the problems are expected and how severe they will be if restrictions are not applied. 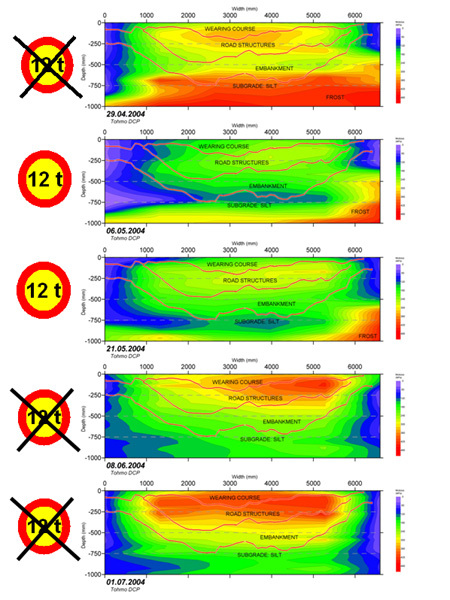 The analyses are usually made based on GPR data, FWD data and drainage condition. 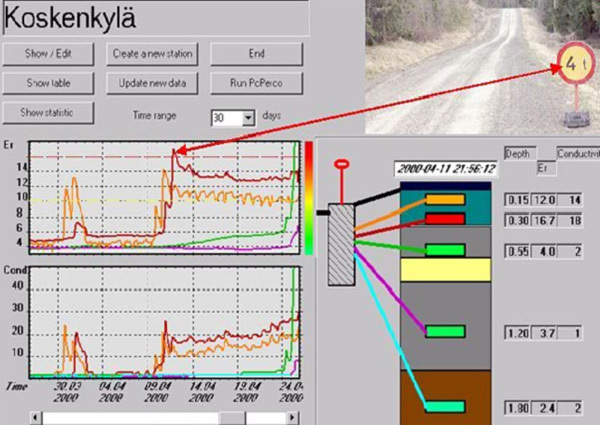 Data from profilometer surveys can also be useful in risk analyses of paved roads if it is available. 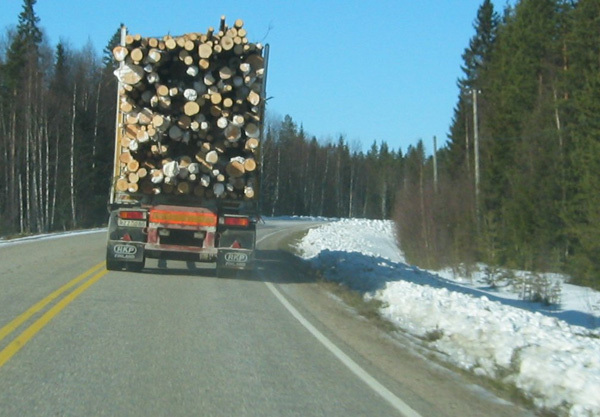 Are load restrictions needed annually? Some of the weakest roads will need load restrictions every year but most roads will only have problems during the most severe winter freeze-thaw cycle periods, or during spring thaw weakening periods. The need for load restrictions can be determined from historical data, if it exists, but some risk predictions can also be made. The risk of a severe spring thaw weakening can be made in the early winter after the roads have been frozen. 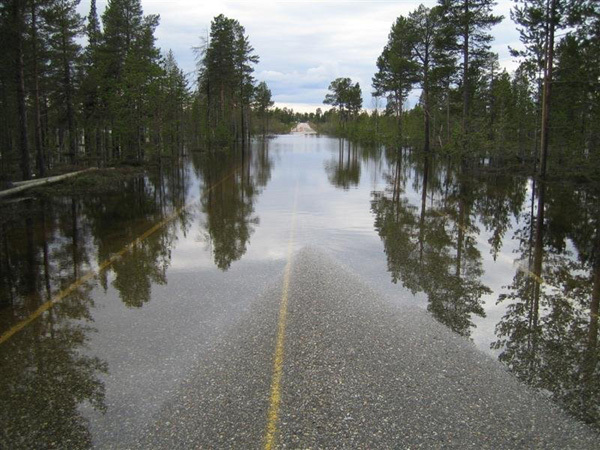 The risk for severe spring thaw problems will be high if the roads were wet when they froze, and groundwater tables were high. 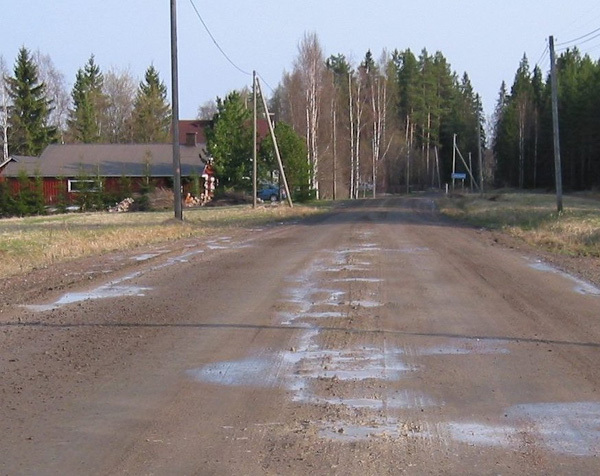 Conversely, mild spring thaw problems can be predicted if the roads were dry when they were frozen. 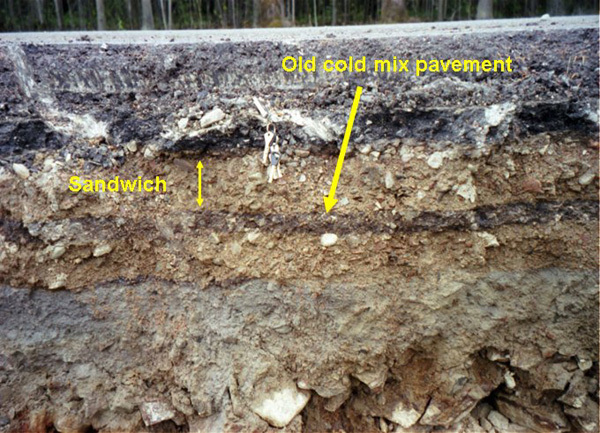 A similar prediction can also be made if the air temperatures were very low during the early freezing period and the frost line penetrated quickly to the subgrade without forming ice lenses. However it should always kept in mind that the weather, and the amount of heavy traffic, during the thawing period will have the greatest impact on whether a road will have spring thaw weakening problems and the need for load restrictions. 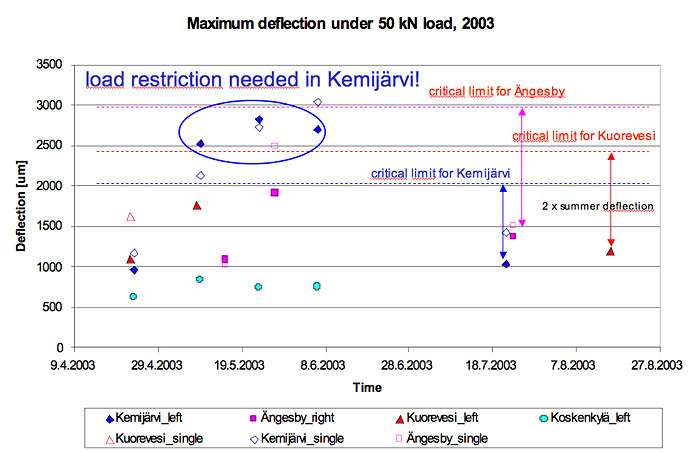 When should load restrictions be applied? 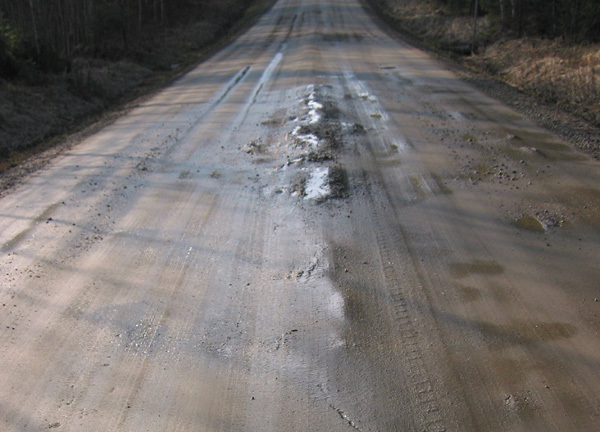 The ROADEX surveys have revealed that the most critical time to successfully overcome spring thaw is during the early spring when the road surfaces start to thaw. 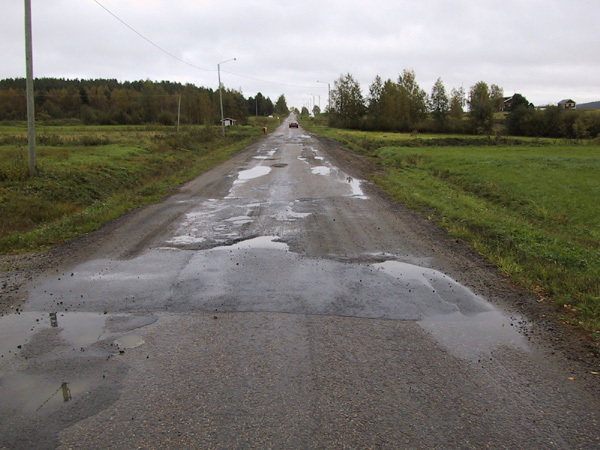 If the weather is dry at this time, and the roads are not loaded too frequently, with long enough recovery times between loadings, there is a good chance that any water will evaporate quickly from the surface layers and that a ”dry crust” will form on top of the structures. 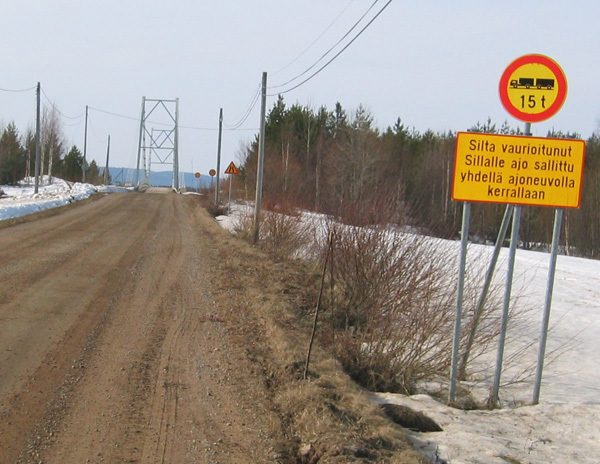 When there is a confident prediction of spring thaw problems, and roads are expected to have heavy traffic, restrictions should be applied as soon as the frost front has thawed to the level of 100 – 150 mm below the road surface. It is extremely important to monitor the moisture content of the road and weather conditions at this time. 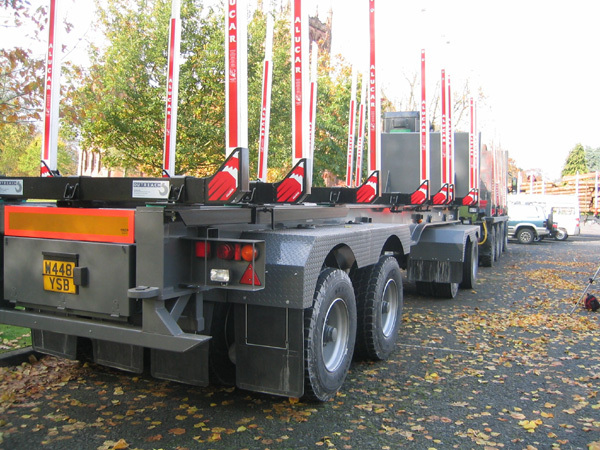 What is the maximum allowed axle load / total weight allowed? This is a very difficult question and the ROADEX project could not give any simple answers to it. 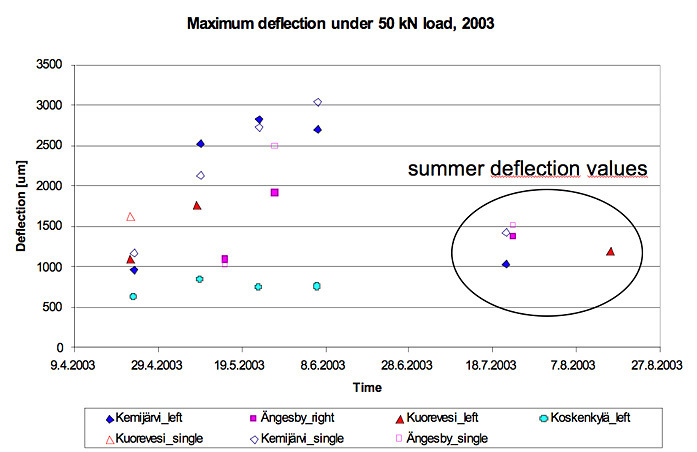 One way that has been used in some areas is to use FWD summer deflection data as a reference source to fix acceptable deflections, and during the spring thaw period to test the road with different load levels. 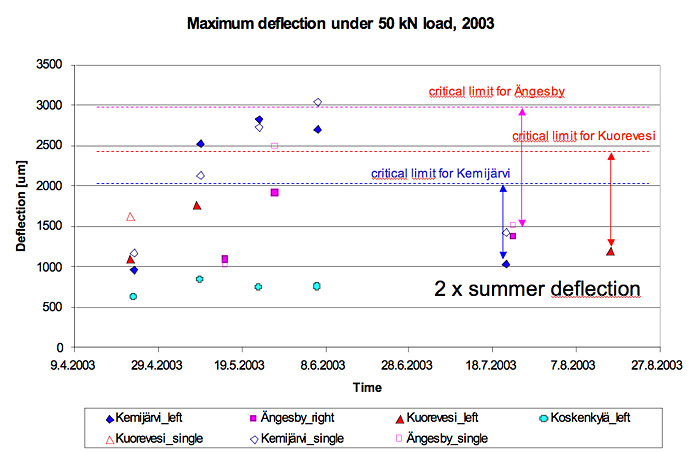 A restriction could then be placed on those loads that exceeded 2 times the summer reference deflection. When can load restrictions be removed? Weight restrictions can, and should, be removed immediately there is strong enough evidence that the road can carry heavy vehicle loads. 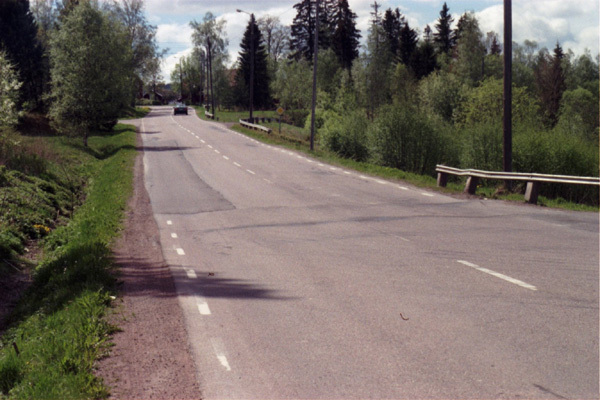 or DCP (12)surveys, by making test loadings, or just based on visual evaluations made by the local road engineer. ROADEX reports have detailed descriptions on how to use these techniques. 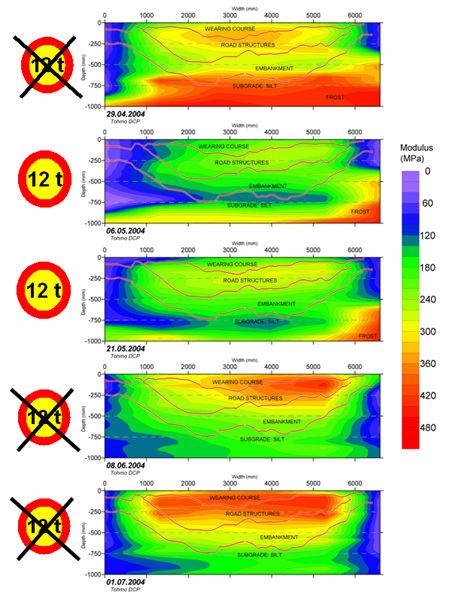 How loads are monitored during the restriction time? 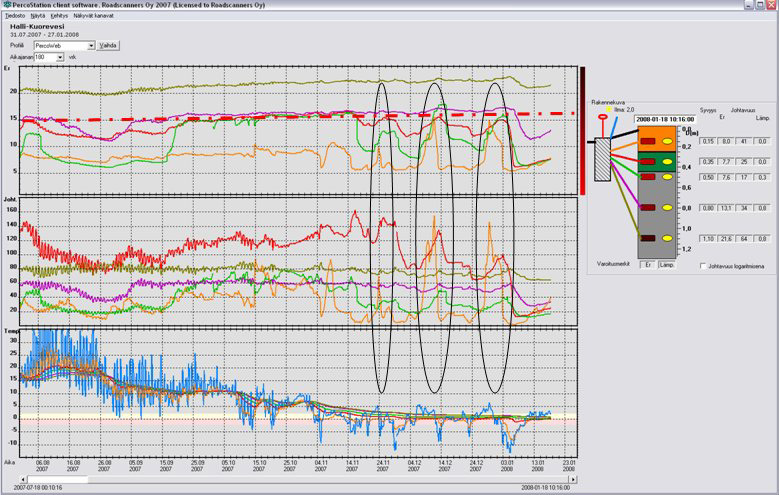 There are no special systems for monitoring loads during the spring thaw weakening. Monitoring policies for axle loads and total weights vary greatly from country to country across Northern Periphery as the figure shows. 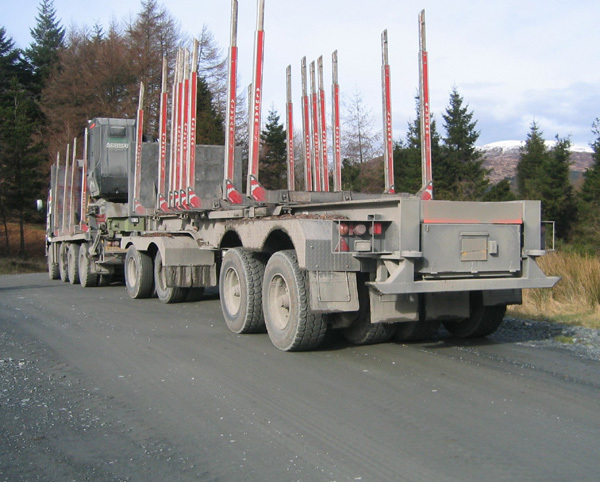 The easiest, and most commonly, used way to monitor loads during temporary load restrictions is to apply a 12 tonnes maximum total weight on the road. This effectively means that only unloaded trucks can drive on the road. If empty trucks need to be prohibited the maximum weight should be restricted to 6 tonnes. 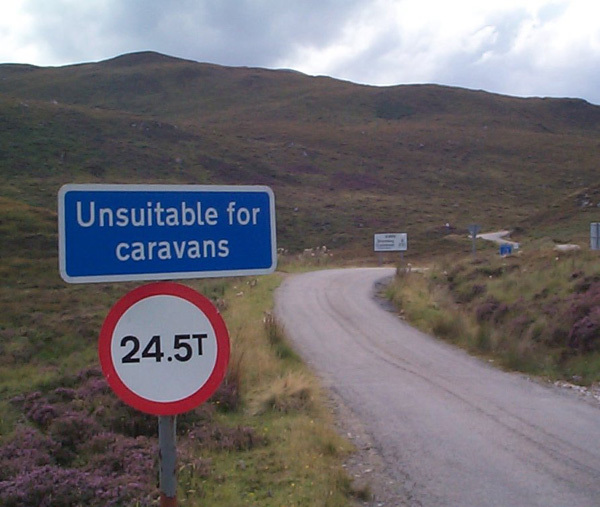 In Scotland vehicles can also be restricted by defining a „maximum allowed length? for the vehicle. One option for load restrictions in the future could be the use of road recovery times to protect roads from major failures during the spring thaw. 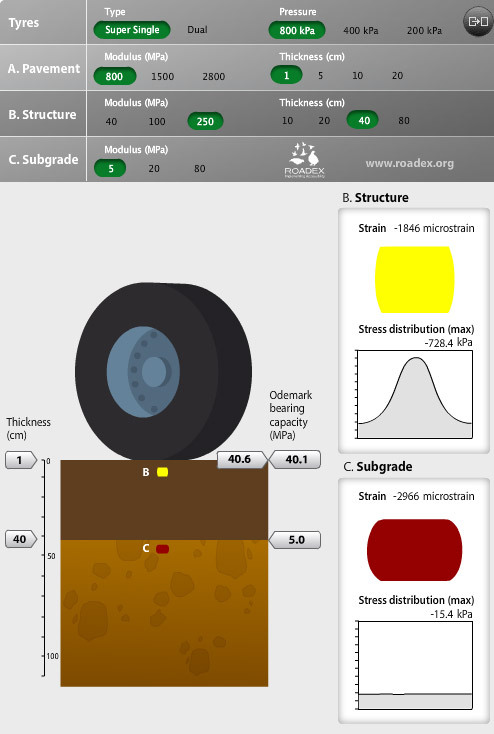 As the ROADEX project results have clearly showed, road materials and subgrade soils that do not have an entirely elastic behaviour need time to recover from a heavy vehicle passing. 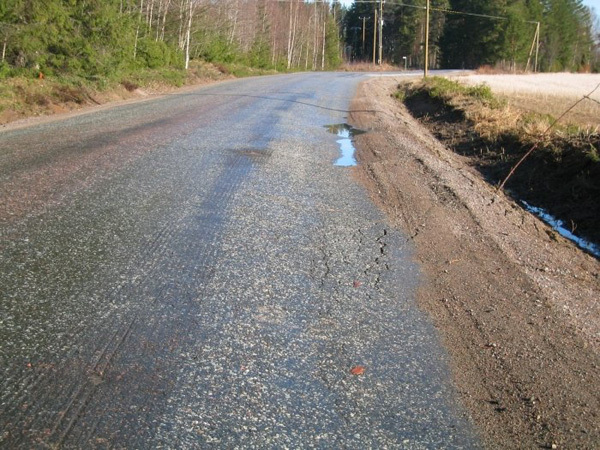 Repeated loading, even with a low stress level such as human foot, can lead to severe plastic deformation during spring thaw weakening when road structures and subgrade soils are saturated with water. and b) the recovery of the pumping effect. 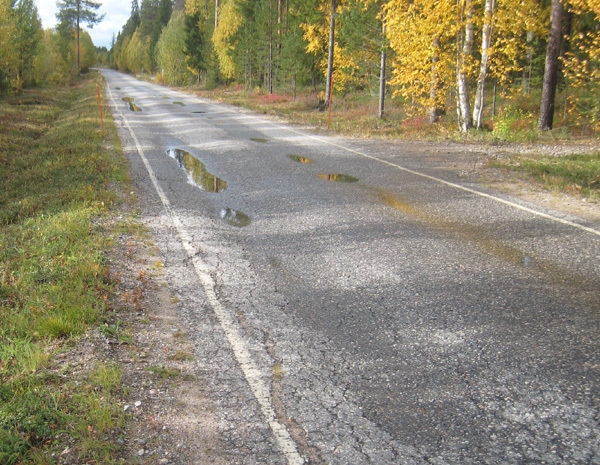 The first of these, the recovery and rearrangement of the pore water molecules can have an effect on Mode 1 rutting on roads with relatively high traffic volumes, but the underlying physical/chemical process is not yet clear. 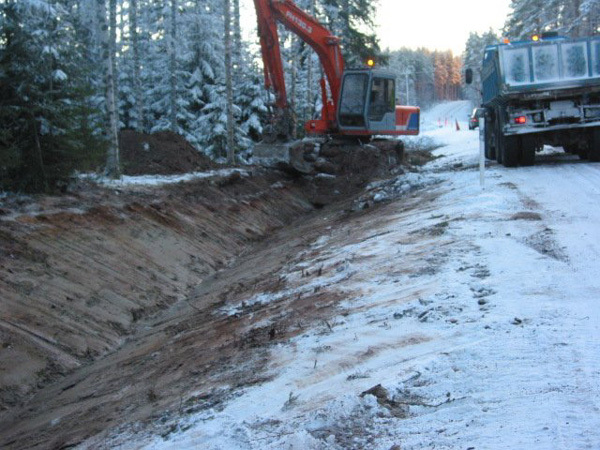 The second part, pumping, is very important for low volume roads with weak subgrade such as silts and peat when the upper road structures are not stiff enough to spread the load to a wider area. 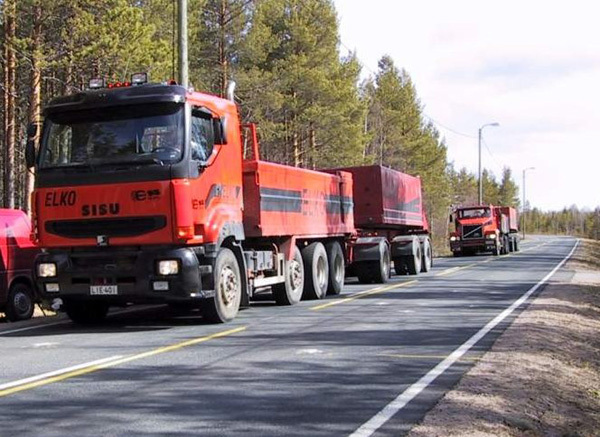 In this pumping recovery phase, the worst thing that can happen to the road is convoy driving with several heavy trucks driving close to each other. 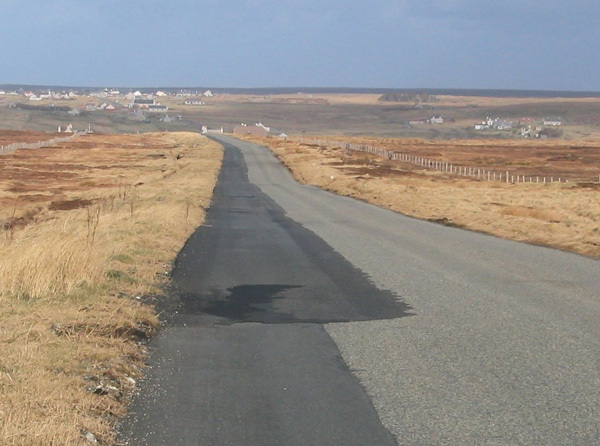 This leads to a fast and severe failure of the road. 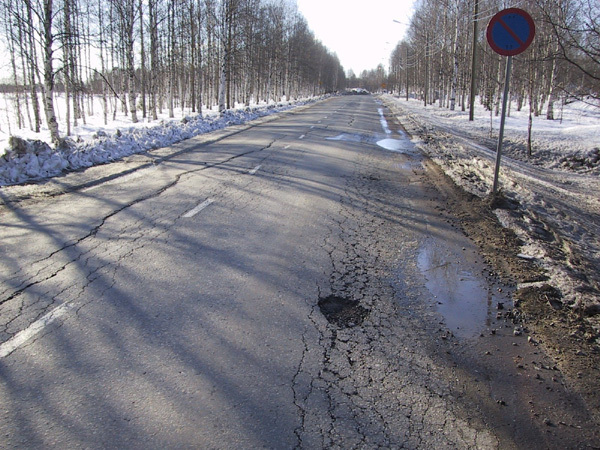 However when it is known that the road is sensitive to permanent deformation, the information can be used for road condition management during spring thaw periods, or during winter freeze-thaw cycles. An animation showing the principles of recovery time. 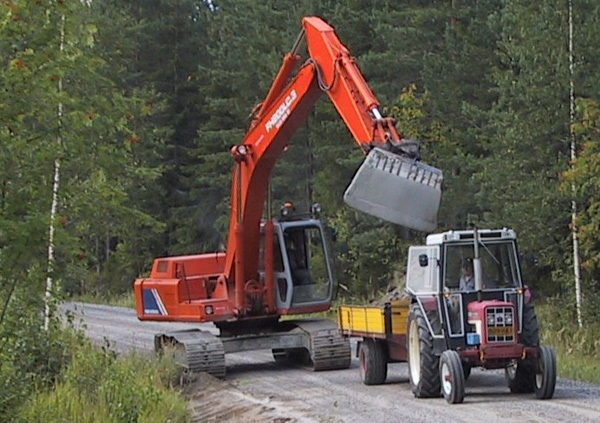 A good example of this local practical experience comes from Sweden where a local maintenance contractor gave “time slots” to heavy trucks that wanted to use the road. Based on the strength of the road structures these slots were given either in 6 or 8 hours intervals. 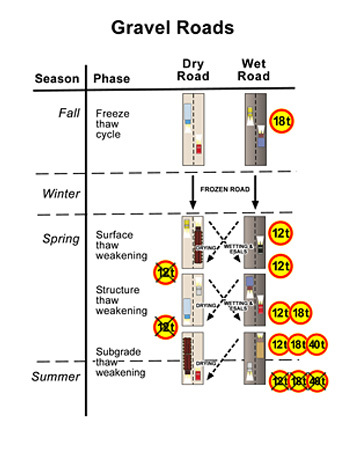 The recovery time of a particular road section is dependant on the road structure and on the severity of the spring thaw period. Detailed information on recovery times is not yet available and further research is needed. But based on the interviews during the ROADEX project some general conclusions can be reached. 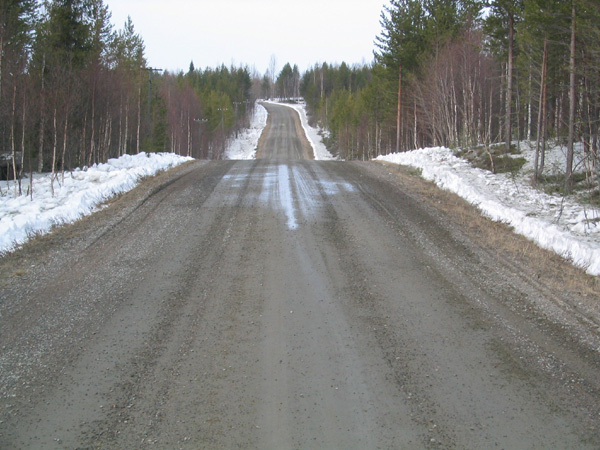 On weak paved road recovery times can be 3-4 hours, on stronger gravel roads 6 hours, on weaker gravel roads 8-10 hours, and on stronger forest roads 10-12 hours. 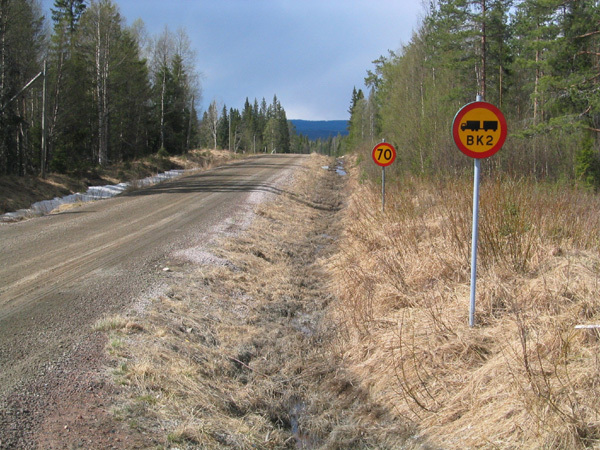 On weaker forest roads heavy traffic should not be allowed to use the road or, if the use is necessary, the recovery time should be specified to be at least one day. 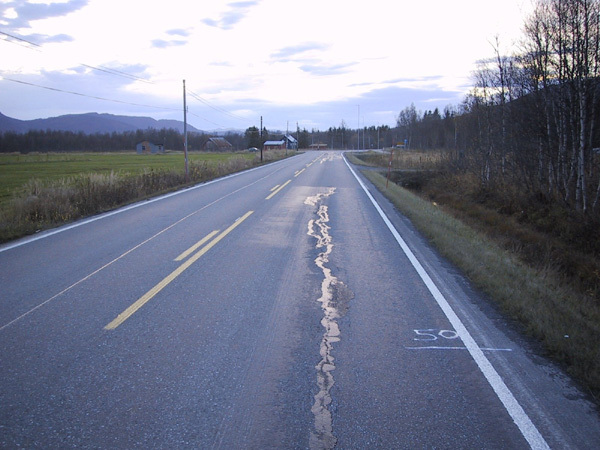 The ROADEX results have also shown that long loading times increase the time that the road needs to recover. 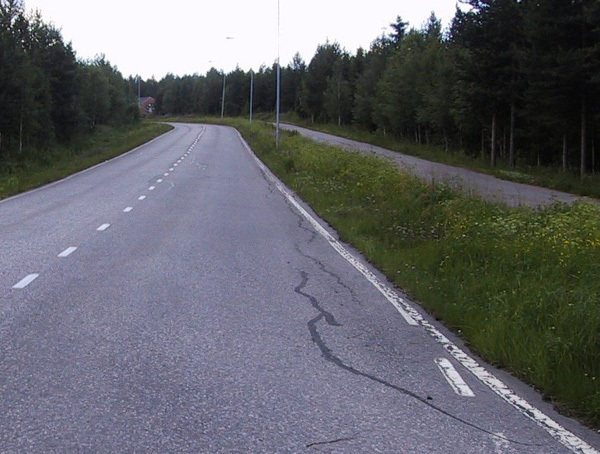 Drivers should therefore be advised to drive these roads relatively quickly and not to stop on the weakest places. An alternative way of reducing the stresses on a road is to amend the contact pressure of vehicle?s tyres on the road by reducing the pressure in the tyres. “Central Tyre Inflation” (CTI), is the generally accepted terminology for the onboard automated system of tyre pressure control that permits the driver of a vehicle to adjust the pressure of the tyres on the vehicle whilst the vehicle is in motion. A number of automated systems are available worldwide. 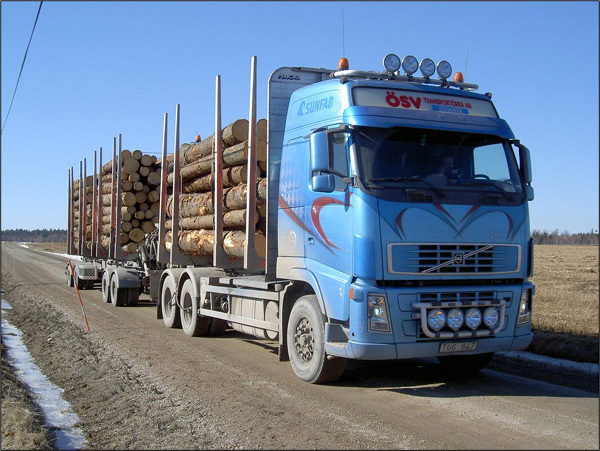 Tyre Pressure Control on Timber Haulage Vehicles. Tyre manufacturers recommend that tyres should be inflated to suit the load on the tyre, the speed of the vehicle and the type of use. Their recommended pressures are a „best fit? to suit the overall daily work of the vehicle, and do not produce the best contact area at all times. 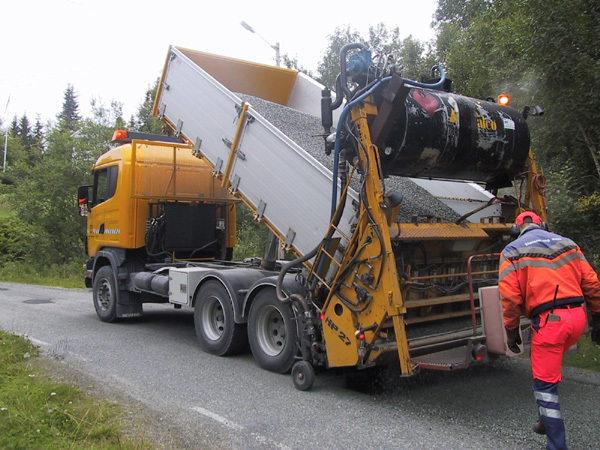 CTI makes it possible to suit the changing circumstances encountered by the vehicle during its working day: loaded or unloaded, slow or fast vehicle speed, type and bearing capacity of the road, road surface properties, and others. In its simplest form CTI takes compressed air from the vehicle's onboard compressor and routes it through air hoses, under control, to inflate the vehicle's tyres. 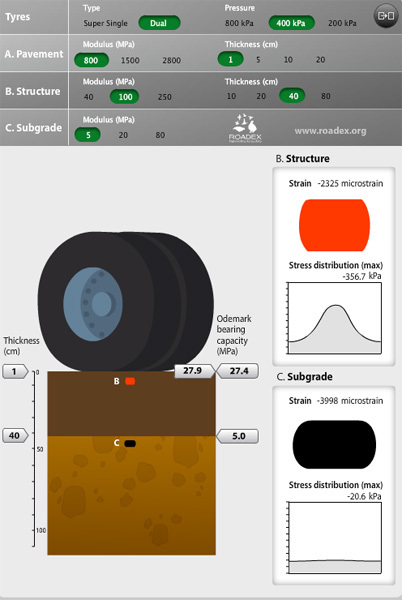 The radial tyres that are fitted to heavy vehicles do not change their width with pressure change and as result, lowering (or raising) the pressure in a radial tyre, increases (or reduces) the tyre's contact length, or “footprint”, on the road surface. 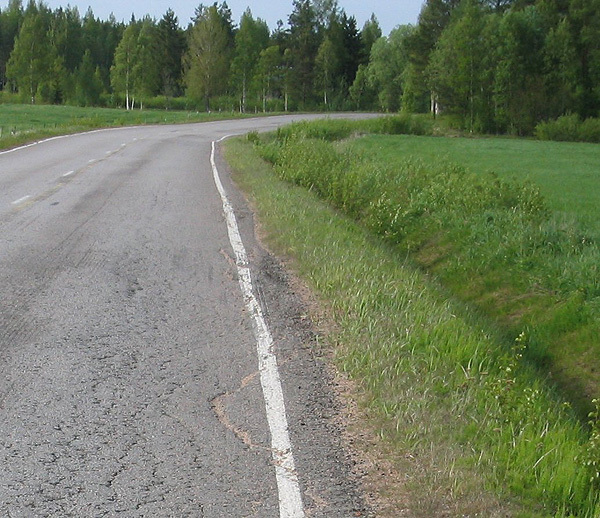 This action lowers the stress level on road especially close to the road surface. CTI is very good for minimising Mode 1 rutting. 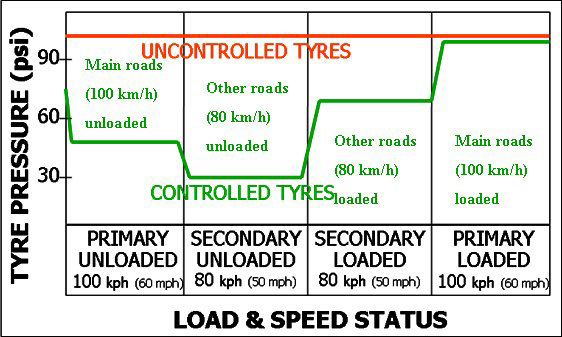 Reduced tyre pressures reduce stresses particularly in the road structures closest to the road surface. 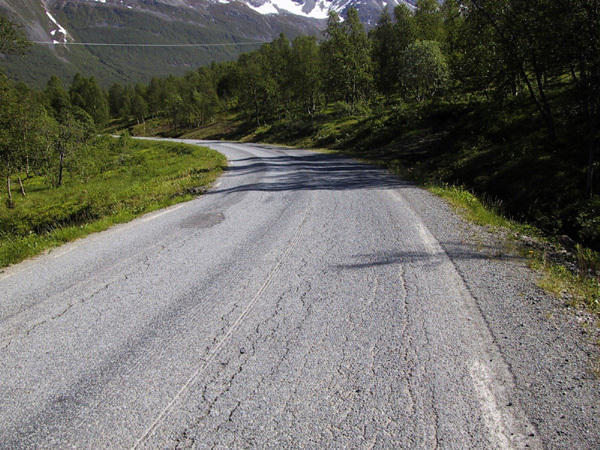 It also allows the surface of the road to cure faster and increase its stiffness quicker. A further benefit of CTI is that it equalises tyre pressures in twin tyred systems giving rise to better distribution of load between the tyres and equal contact patterns on the roads. CTI systems are stated to offer other benefits. It is claimed that they improve vehicle responses at speed on main roads through having optimum tyre/road contact. Off road, flexible tyres and longer footprints give greater flexibility and improved traction on rough and weak forest roads. This helps to reduce tyre slip and enables vehicles to negotiate loose, undulating, stony surfaces with minimum tyre damage. Low pressure tyres are also said to better deal with bumps and rough surfaces, minimising vibration into the truck and driver. 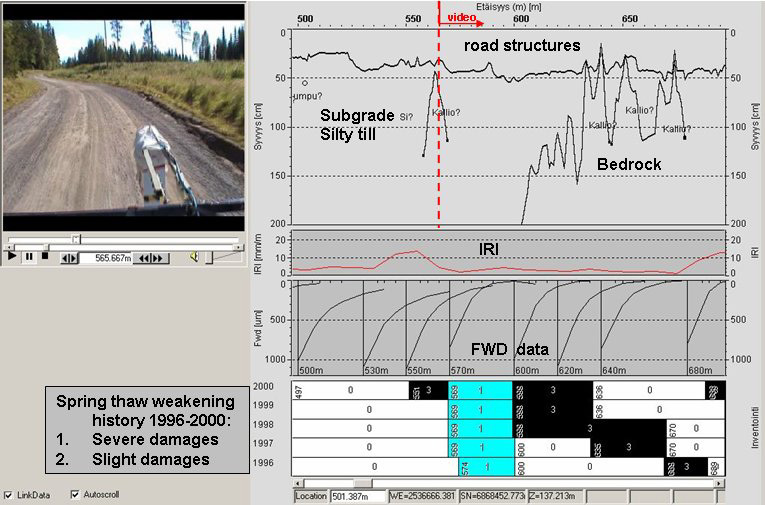 Mode 1 rutting problems on forest roads can be managed, or reduced, by using vehicles with special axle configurations. 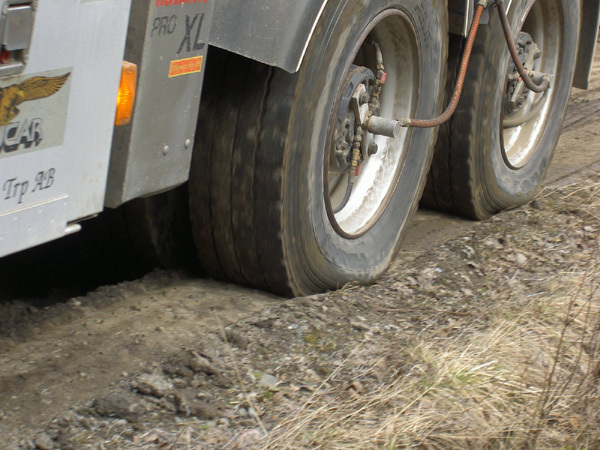 An example of this is can be seen in Scotland, where the tyres of a truck have been specially constructed to be out of line longitudinally, and thus act as roller compactor preventing the formation of ruts. 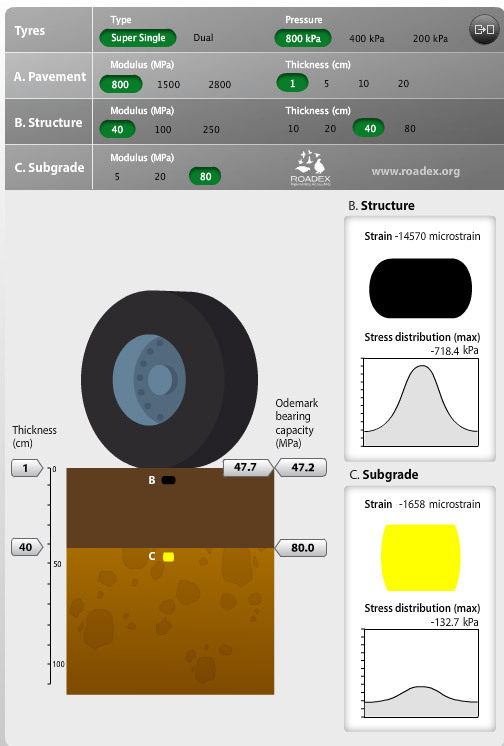 An animation describing how different axle configurations can affect the development of rutting. 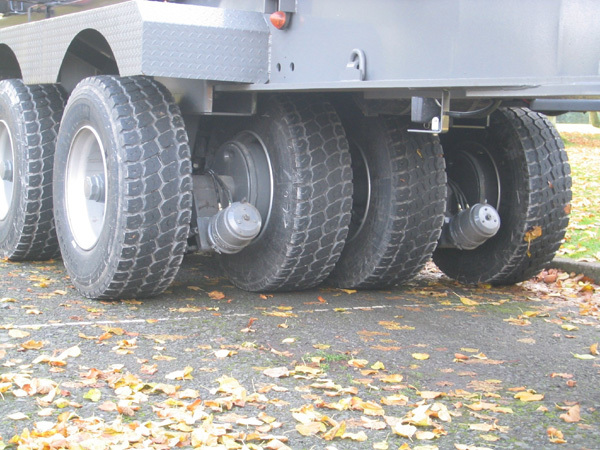 In these “Low Ground Pressure” trucks, the tyres are placed on different parts of the truck axles in order to minimise repeated load cycles on the road structure. The axles and wheels are designed to reduce the ground pressure overall and spread more of the weight of the vehicle over the middle of the road, where the road is at its strongest. This configuration evenly rolls and evens out the road surface, and reduces rutting. 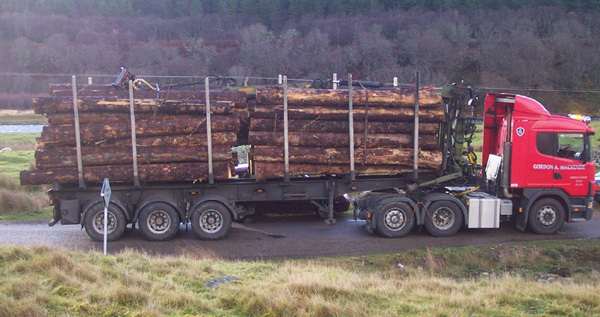 It is particularly useful in Scotland where super single are regularly used for timber haulage. 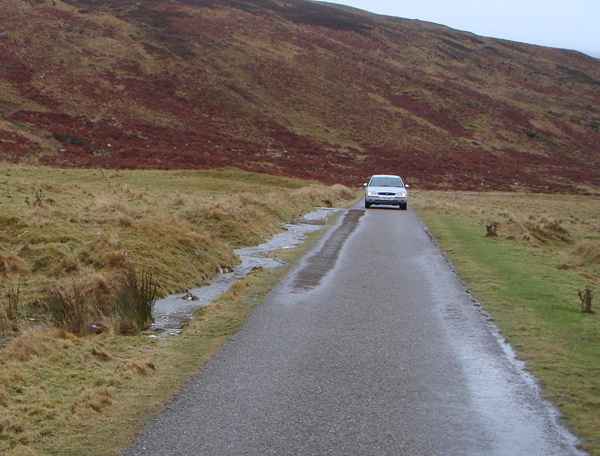 “Low ground pressure” systems have been successfully used in forest roads in Scotland for a number of years and the experiences have been extremely good. 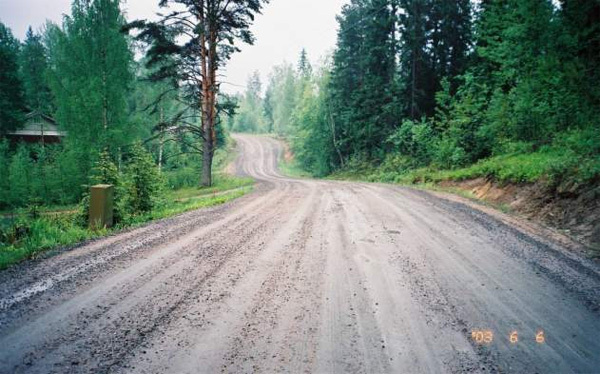 The main problem with the vehicles is that they are only permitted to travel on forest roads because they tend to tear the pavement, or wearing course, on sharp curves. 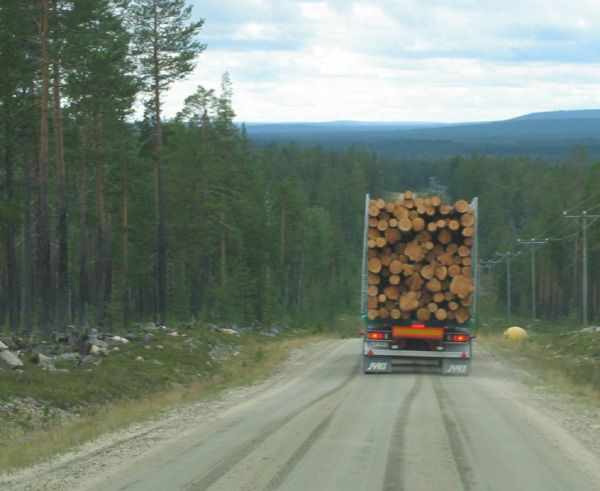 For this reason they are only used at present for the transport of timber over weak forest road sections to temporary stock piles close to paved roads. 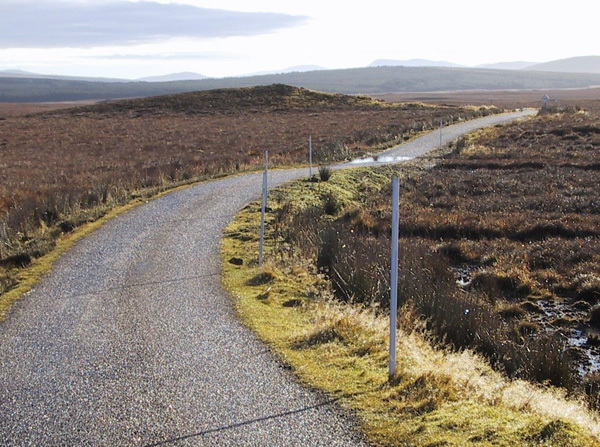 The management of the functional condition of a road network is normally set out in the descriptions of the works, duties and tasks of the maintenance contract document. Of these, drainage maintenance is, by far, the most important factor for managing permanent deformation issues and, because of this, the ROADEX Partners commissioned a special “Drainage” eLearning lesson. 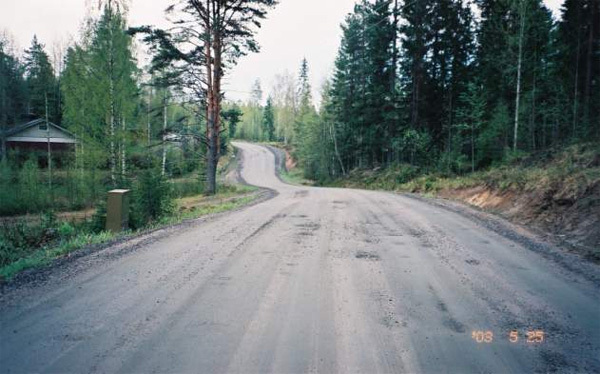 Additional to this, there are some other small, but important steps that the contractor can take to improve the functional condition of a road, and reduce permanent deformation problems. 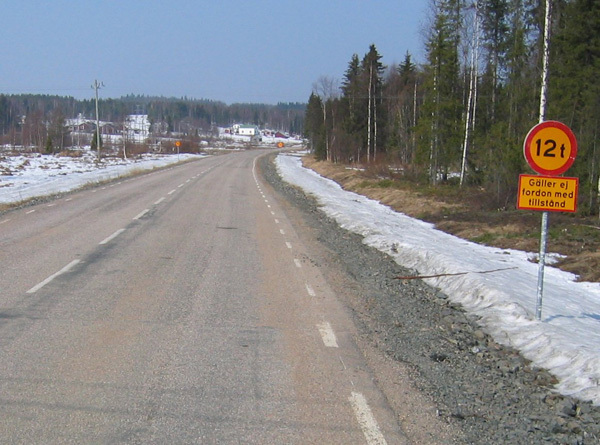 One issue that can save a road, when properly done, is the timely removal of snow from the road shoulder during the spring. 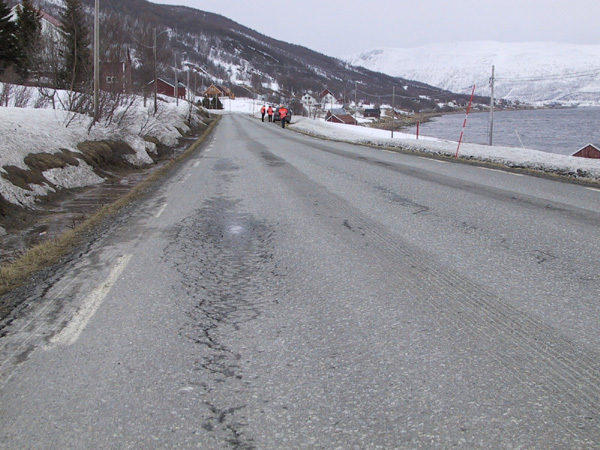 This technique prevents the melting water infiltrating the road structures at a time when the bearing capacity is at its most critical. and using graders more frequently on gravel roads. Better functional condition on a road network will bring better feedback from road users, and more satisfied and healthier truck drivers. 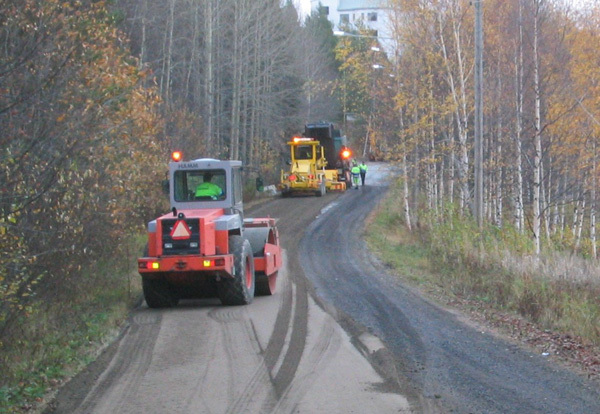 And a final operation that can be employed is surface dressing. 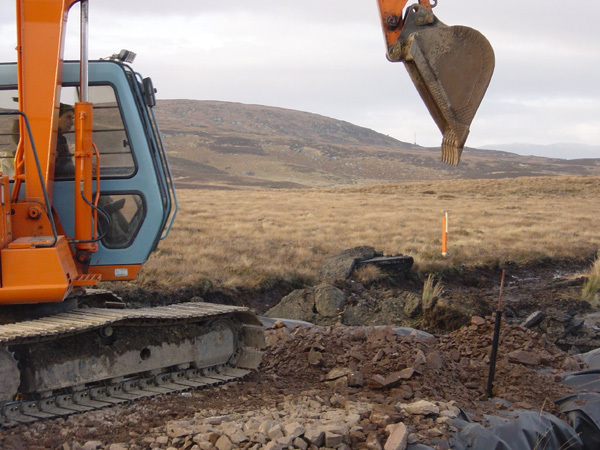 This is mainly carried out by specialist contractors and is recommended by ROADEX. 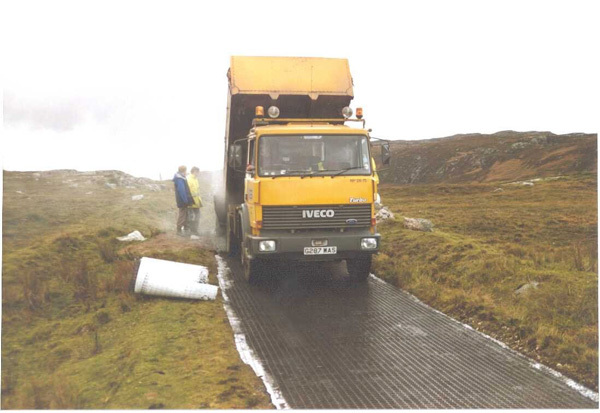 Surface dressing provides a good seal to a road pavement, that prevents water infiltration into the road structure, and thus reduces permanent deformation problems. accessibility by heavy traffic, is it 24h / 365days? the geometry of the road, can it be improved? traffic management during the work, are road closures allowed? A number of ‘special’ issues also need to be considered during the design phase to avoid unpleasant surprises later on site. An example of this the identification of areas for materials excavated in improving drainage and/or excavated from soil replacement sites. The unit prices / taxes for dumping of excavated material should also be ascertained. These considerations vary from country to country. 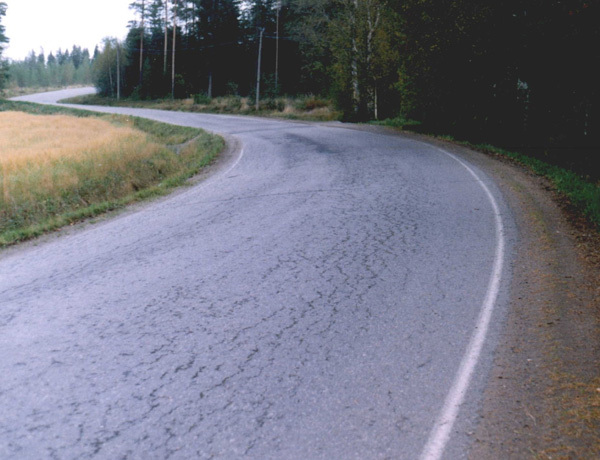 The following “examples” provide some general information on typical structural options that can be used to improve structural conditions on rural roads. Adding new layers on top of the existing layers is the “classic” solution to permanent deformation problems as it effectively reduces the strains causing Mode 2 rutting and decreases frost problems. The method works well if the structure is well designed and there is new material locally available for the structures. However it has been widely used as a “patent medicine” for all problems without thought for the underlying reasons for the problems, and many structures have failed soon after construction as a result of this. 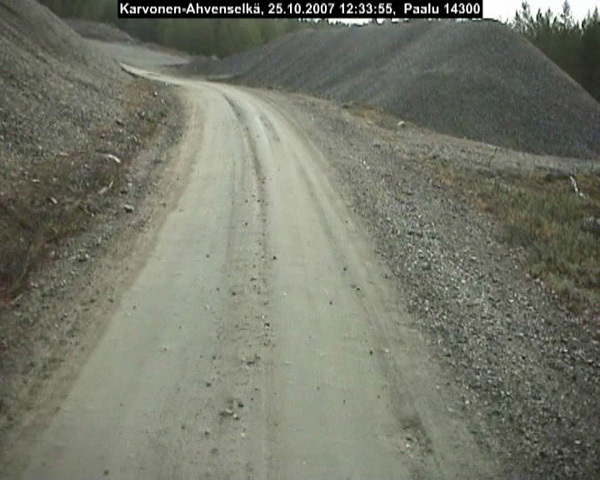 Animation showing the sequence of adding new layers on top of an existing road. Keep in mind that the old pavement has to be removed or crushed before the new layers can be added. Do not leave old impermeable pavement beneath the structure, ie do not make a “sandwich structure”. 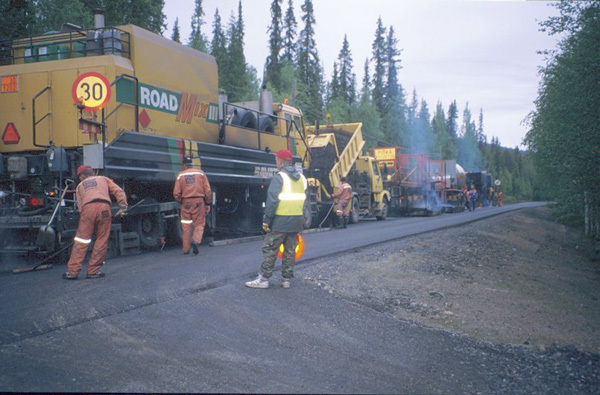 If old pavement must be left, the thickness of the new unbound layers should be at least 40 cm. 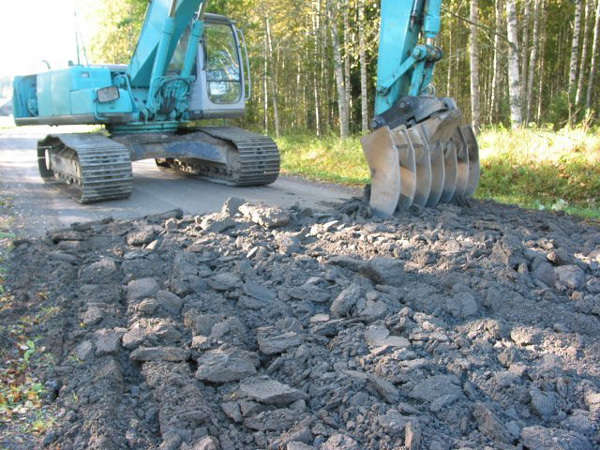 If the subgrade has large boulders close to surface remove them before adding any new layers. This will make the foundation more homogenous. But do not do this in the late fall when road structures are likely to be wet. 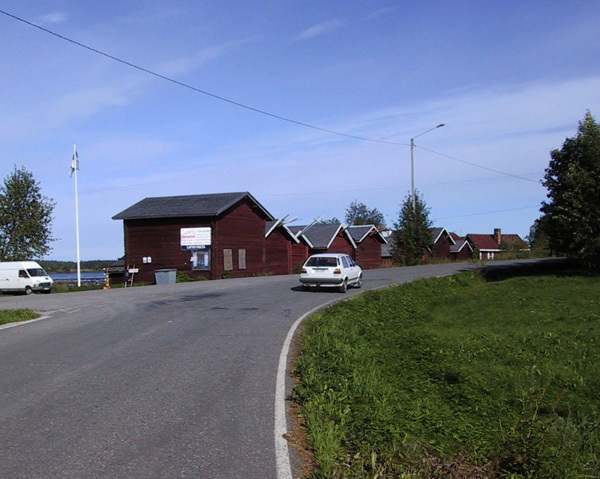 There is insufficient road width. 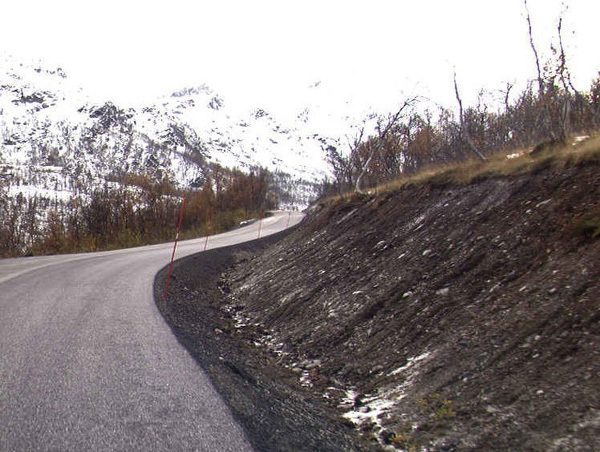 Keep in mind that raising the grade line requires more space for the road – or steeper inner slopes. Guard rails may be necessary. The road is located in an urban area (village) with house exit roads, drainage wells, pipelines etc. The road has guard rails. These will have to be lifted. 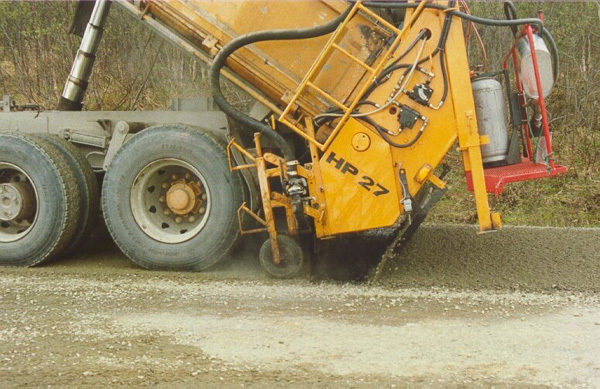 'Mixmilling’ is a technique where the pavement and base course are mixed together using a mixmilling machine. After mixing the road structure is normally shaped and compacted, and new pavement is laid on the top of the mixmilled structure. In this way the grading of the mixed base course will have been improved as material from the old pavement will have been mixed into it. This also makes the base course a little stiffer. Animation showing the mixmilling process. 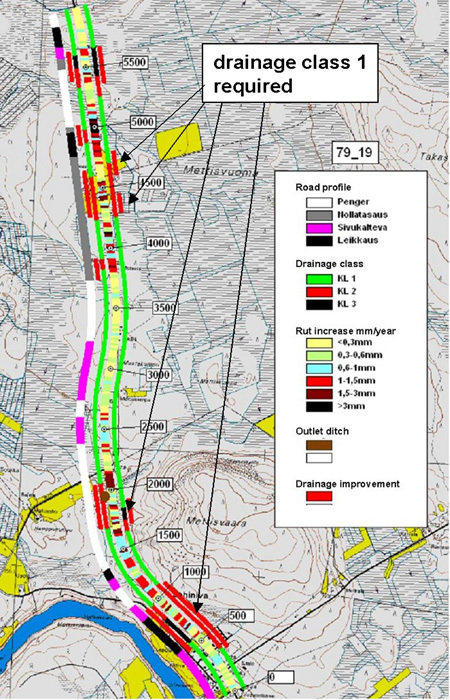 When the old pavement is mixed into the old base course its grading is improved, and the bitumen released from the broken up pavement binds the fines. For this reason, in many cases in the design process, the base course moduli value can be increased by 50 MPa compared to the existing back calculated value. 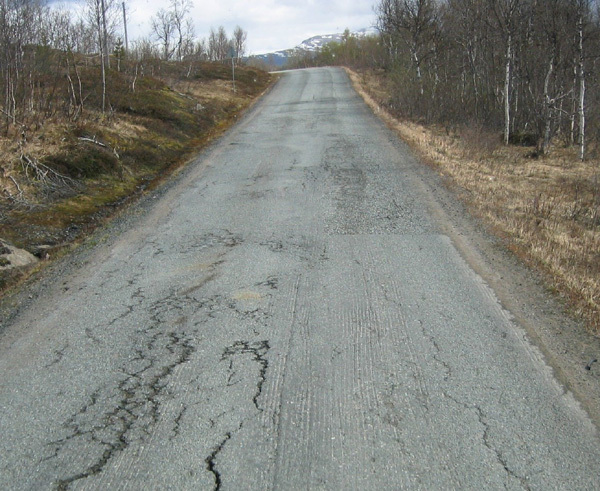 Mixmilling is an ideal technique where a road has major rutting problems, has lost its shape, and its crossfall is poor. 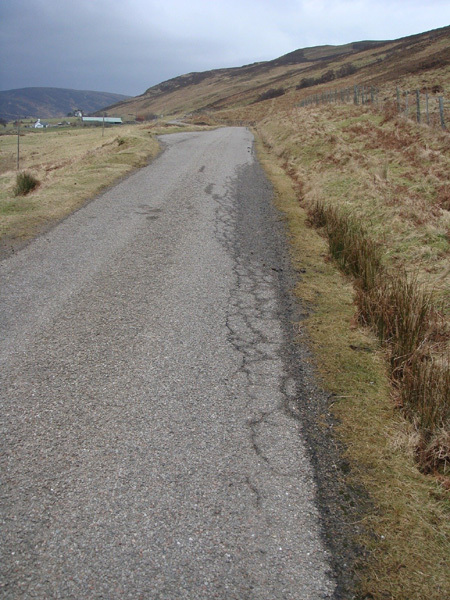 When properly carried out, the top part of the road will become homogenous and a good crossfall can be restored. The technique is however only marginally beneficial in improving bearing capacity problems. 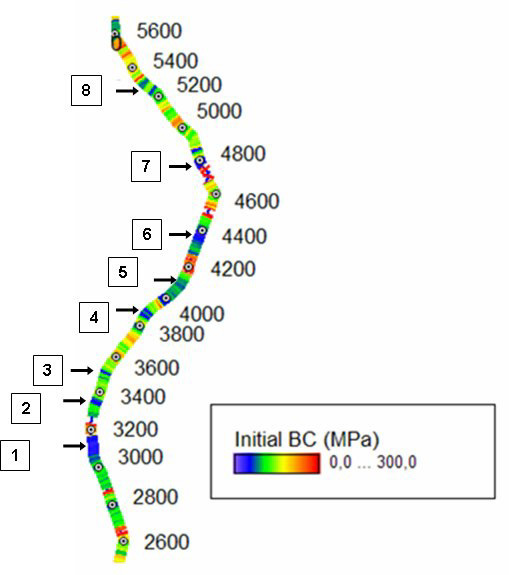 Any improvement in stiffness will be based only on a slightly better base course of mixed old bituminous layers and the new pavement layer on the top. For this reason drainage improvement should be always done in association with mixmilling, or one year before. In this way the lifetime of these structures can be markedly improved. 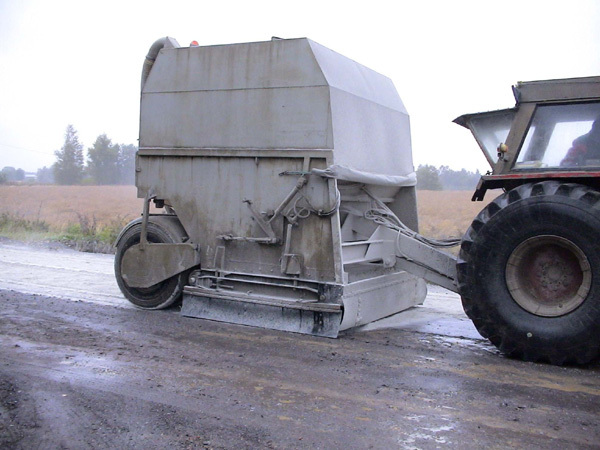 Mixmilling is one of the cheapest solutions available to improve a paved road with severe rutting problems. 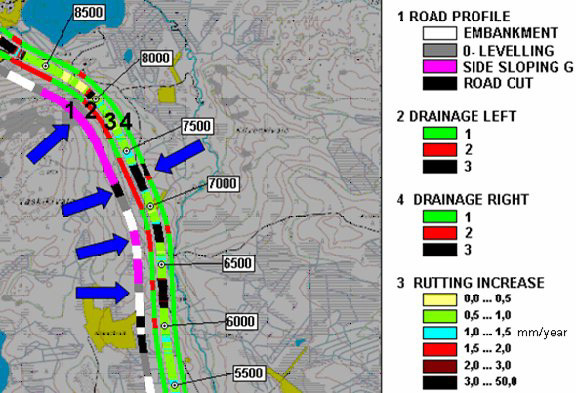 It should/could be tried, together with drainage improvement, as a first rehabilitation solution on low volume roads before any other measure. 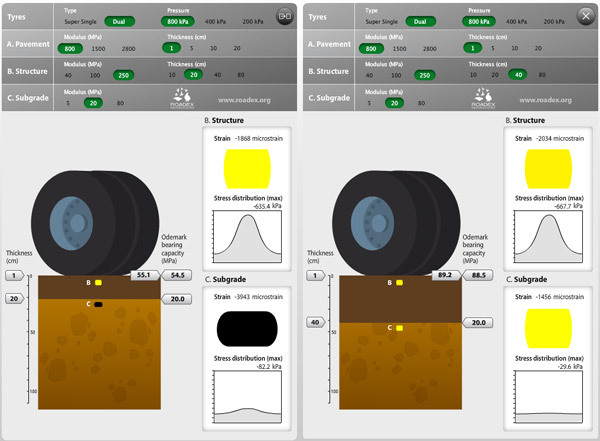 Mixmilling can also be carried out by adding new base coarse aggregates where the grading of the existing base course is poor. In this case the new aggregate is laid on the top of the old pavement before mixing the structure. 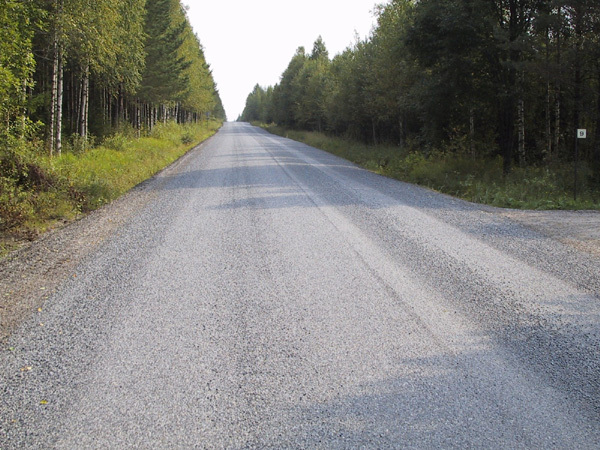 The technique can be similarly used in gravel roads where it is called “coarsening”. Animation showing the principles of mixmilling using new aggregates on top of the old layers. In this case new aggregates are first placed on the top of pavement before the mixmilling is done. Mixmilling with new aggregate can also be carried out by first mixmilling the old pavement and base together before adding the new aggregate. 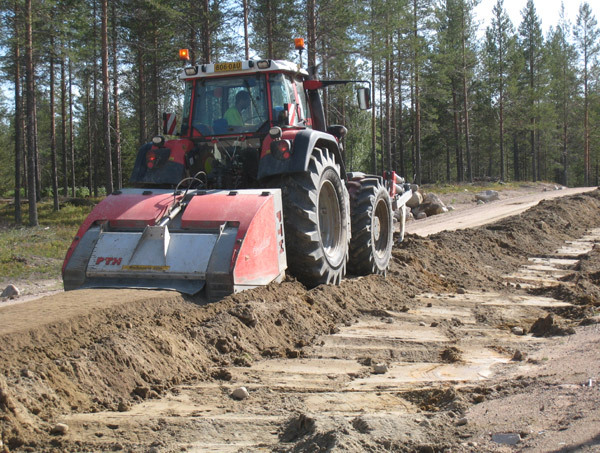 The road can then be shaped with a grader as before and the structure mixmilled again. Animation showing the principles of “two phase” mixmilling with new aggregates. In this method mixmilling is done first followed by the addition of new aggregates and the mixmilling process repeated. In this case the mixmilling depth is greater. 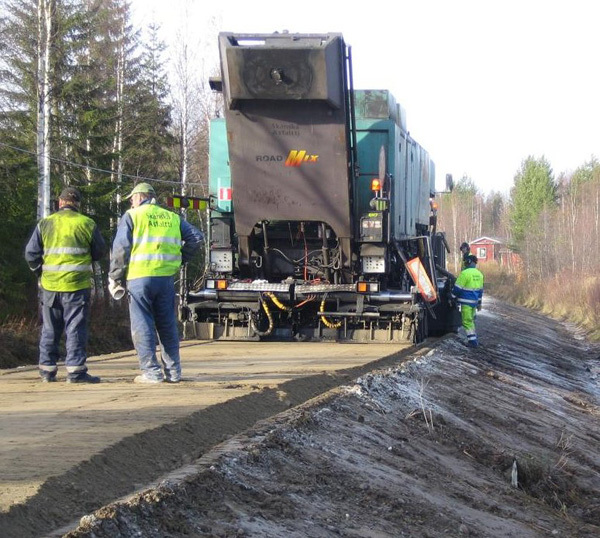 Mixmilling can be used in raising the grade line for roads with frost heave and/or Mode 2 rutting problems, and poor crossfall. In this case the old structure is first mixmilled, shaped and compacted. The new base course aggregate is then laid on top and, if necessary, partly mixmilled with the lower structure. Finally a new pavement is laid on the compacted mixed layers. 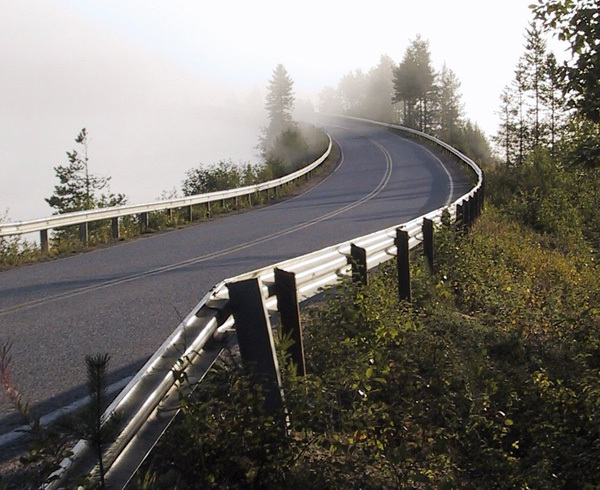 This structure is effective in increasing the bearing capacity of a road and it can also reduce frost problems. Mixmilling, with a new structure on top, is recommended for sites with frost heave problems and/or Mode 2 rutting problems. 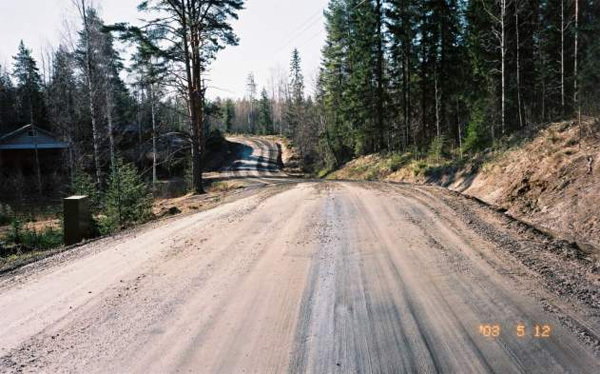 A new method is gaining in popularity in Finland especially for the improvement of public gravel roads and forest roads. 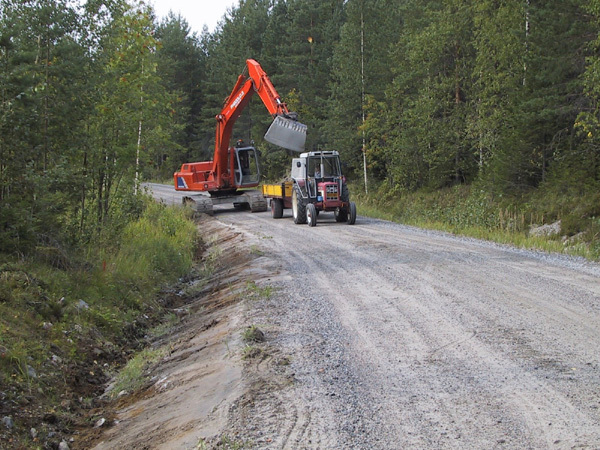 The “Tirkkonen method” combines deep mixmilling with the crushing of large stones into the road structure thereby improving the grading of the combined material. 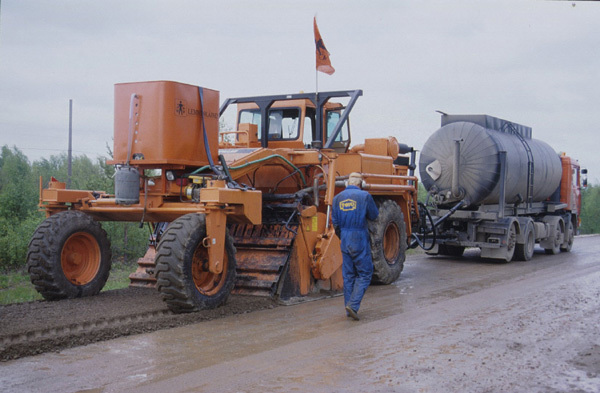 It is especially effective in areas with boulders and big stones in the road structure and subgrade soil that are causing problems in the performance of the road. The method also has the benefit that it can mixmill to a depth of up to 50 cm. The work is normally started by removing the largest boulders from the road and subgrade with an excavator. 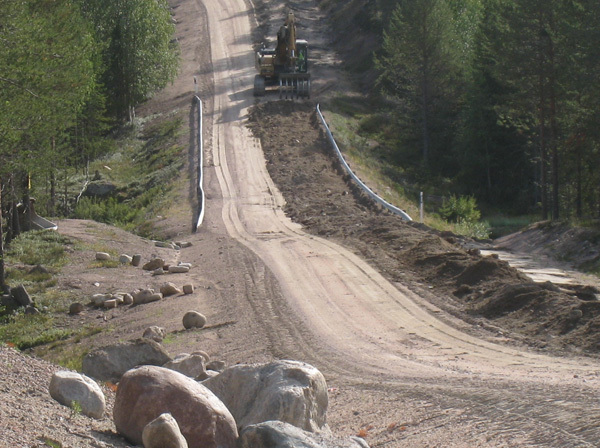 This normally done to a depth of 0,8 – 1,0 m. The excavated boulders, normally larger than 200 mm, are placed to the side of the road for re-use, eg to be transported and crushed in a local crushing plant, or used in erosion protection, or for increasing slope stability. 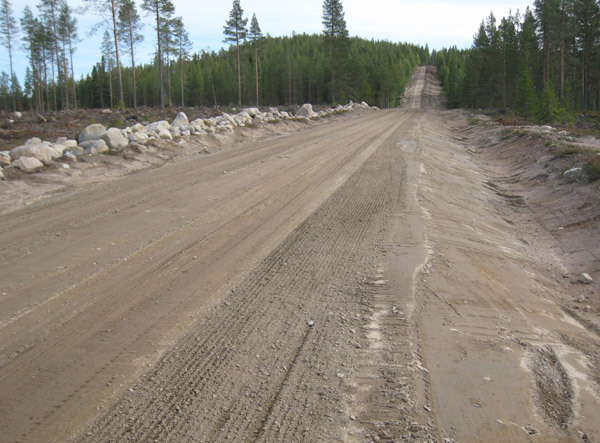 After the boulders have been removed the road structures can be mixed and at the same time any remaining large stones in the road structure can be crushed using proprietary tractor driven machinery. After the mixing/crushing has been carried out the road structure is compacted and shaped and a new wearing course placed on top. 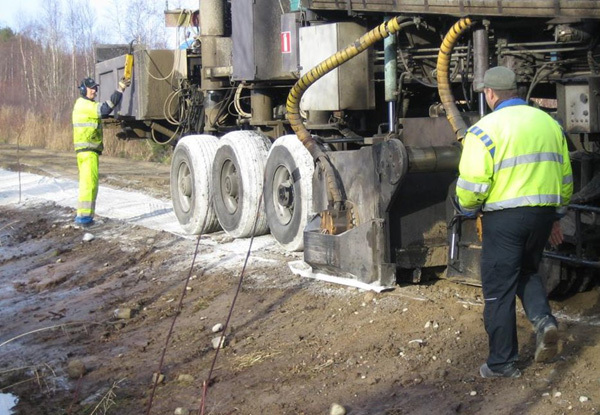 Treatment, or stabilisation, of the base course can be a particularly effective solution for roads with Mode 1 rutting problems and minor differential frost heave (both longitudinal and transverse). 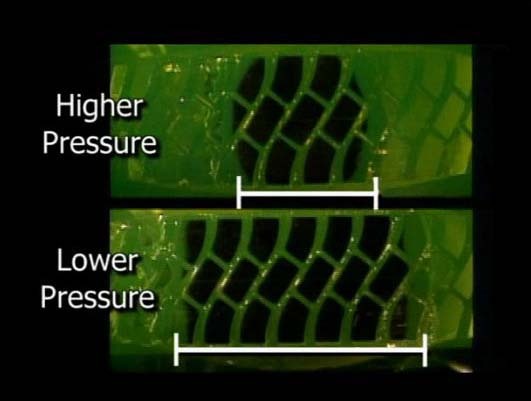 “Treatment” of the base course material improves its resistance to permanent deformation. 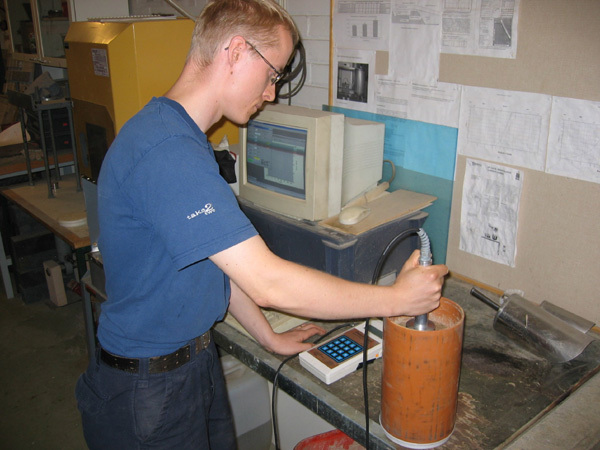 “Stabilisation”, on the other hand, stiffens the base course material to such an extent that it is possible to take a solid drill core from the layer. 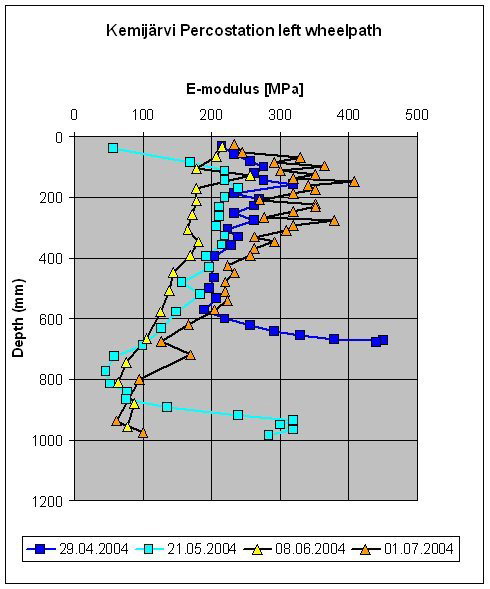 The major problem with base course materials in the Northern Periphery is not however their low resilient modulus but their resistance against permanent deformation. 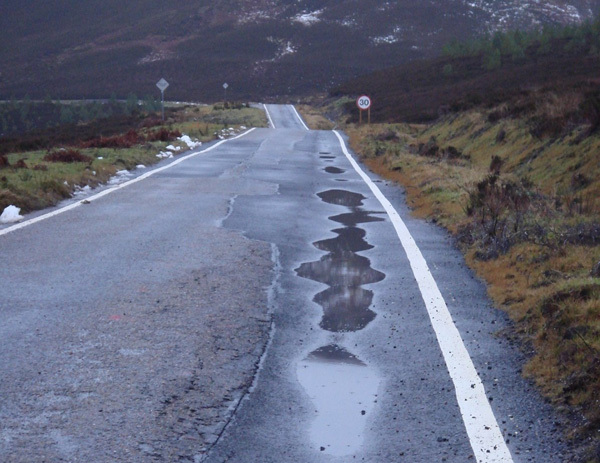 ‘Treatment’ of base course layers should therefore be considered as a serious and cost effective option for low volume road rehabilitation projects. Animation showing the principles of remix stabilization. Treatment and stabilisation techniques are described more detailed in lesson 7.4.3. Good laboratory tests are critical in every project to ensure good results. Any differential frost heave problems should be dealt with before starting the treatment or stabilisation of a base course. 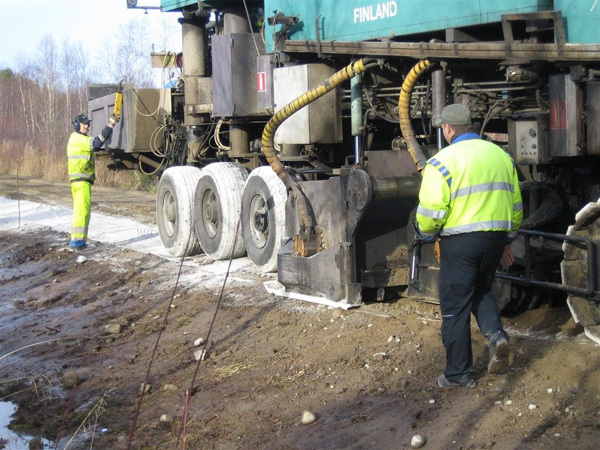 New non-traditional treatment agents will be a very attractive option in the future for strengthening short sections of low volume roads and forest roads with permanent deformation problems, especially where good quality new aggregates are not available locally. 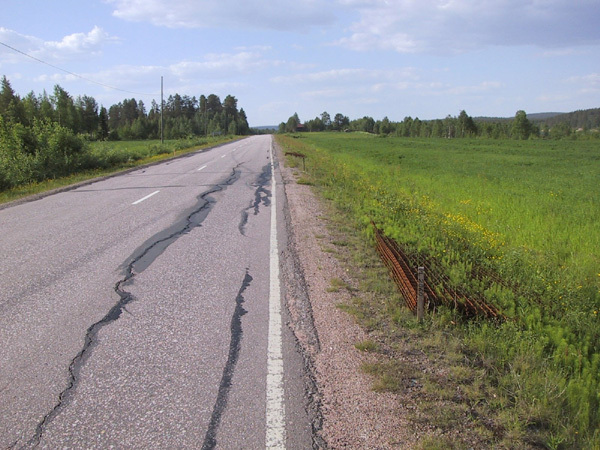 Steel grids have traditionally been used for longitudinal cracking problems against differential frost heave in the tranverse direction. 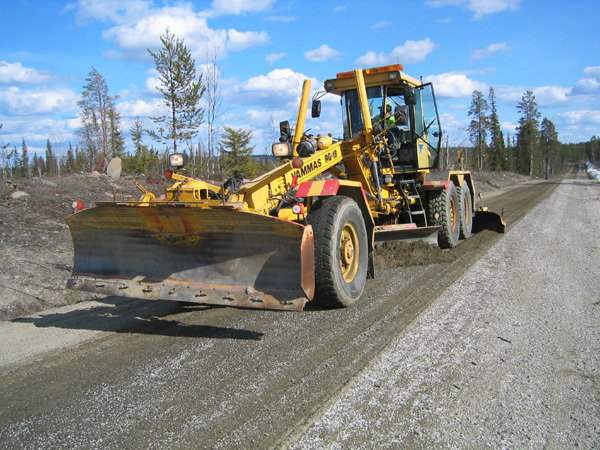 They can also however be used to strengthen roads with Mode 2 rutting problems, or pumping on soft subgrade soils. 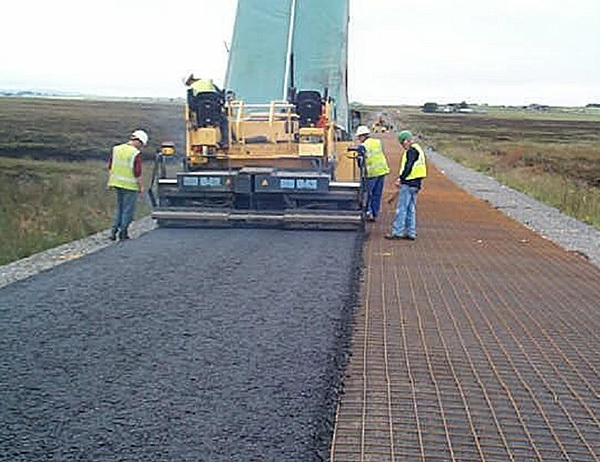 In these cases the steel grid spreads the load across a wider area and reduces the vertical stress at the road structure-subgrade interface. When designing a steel grid structure against permanent deformation the installation depth should be deep enough (20 – 25 cm from the surface) to ensure that a tensile effect is created under the load. The material surrounding the steel grid should be coarse enough to ensure that interlocking occurs between the aggregate and steel grid. 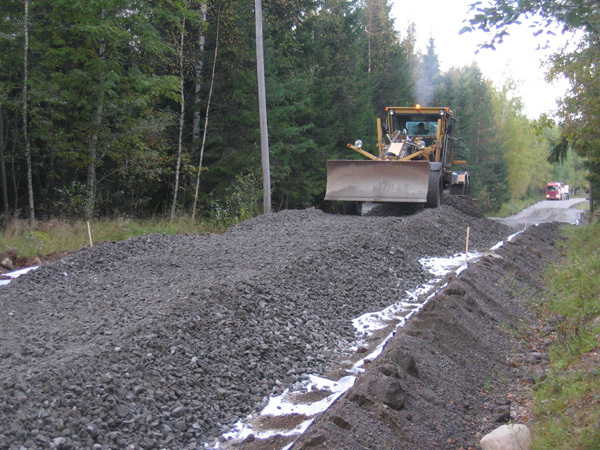 In those locations where the existing road has insufficient coarse aggregate ROADEX recommends that at least 5 cm of coarse base course material is laid under the steel grid. 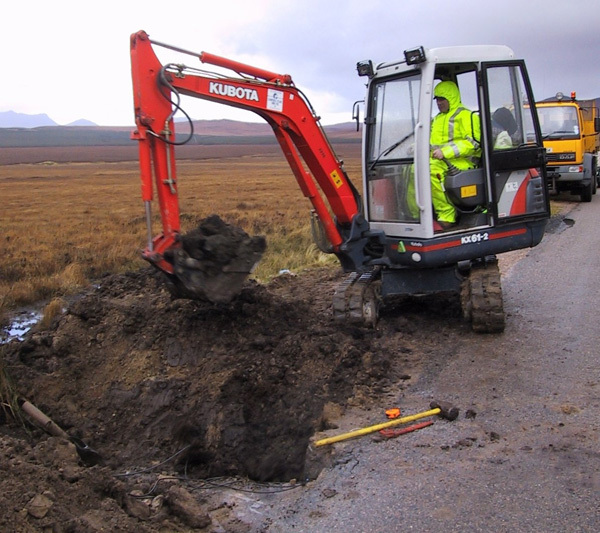 If the problem involves pumping within a road on a weak peat subgrade, a good solution is to remove some of the existing road construction layers first before installing the steel grid. This can prevent unwanted differential settlement later in the life of the road. Animation showing the recommended installation of steel grids on a weak and compressive subgrade. 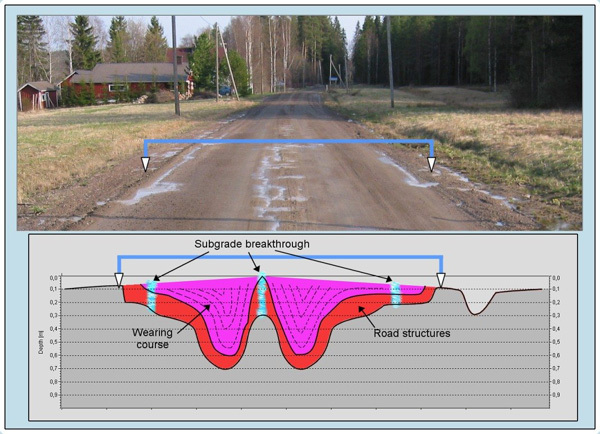 Geogrids can be also good solutions where a pavement is suffering from Mode 1 rutting. This type of structure has been successfully used in Scotland. A steel grid can be installed into a bituminous pavement if it is thick enough. In this case the minimum installation depth should be 100 mm. Test results from ROADEX I showed that if the grid is installed higher in the road rutting problems may develop. 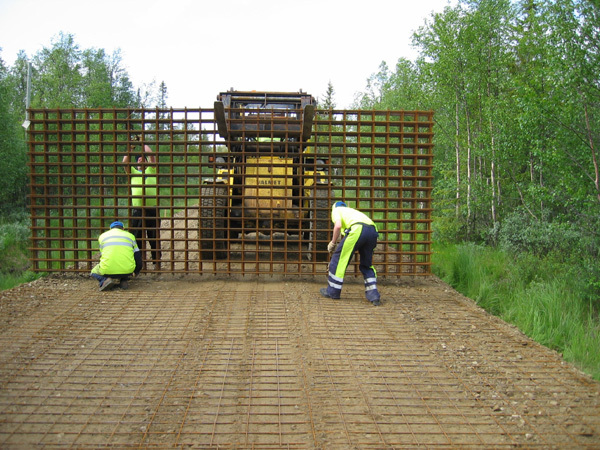 ROADEX recommends that steel grids should be installed in unbound layers at depth of 200 – 250 mm. 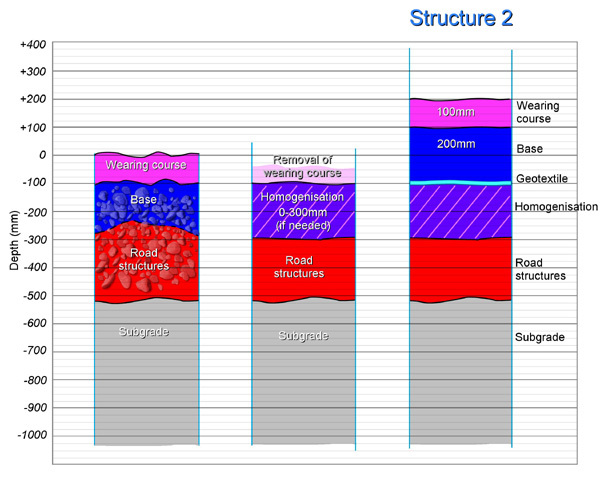 Animation showing the recommended installation of steel grids where the existing pavement is thick. 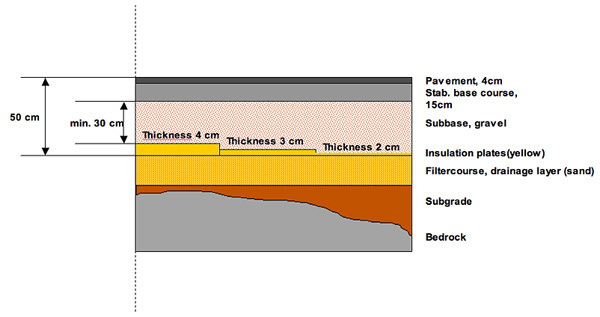 The absolute minimum installation depth for a steel grid is 100 mm. 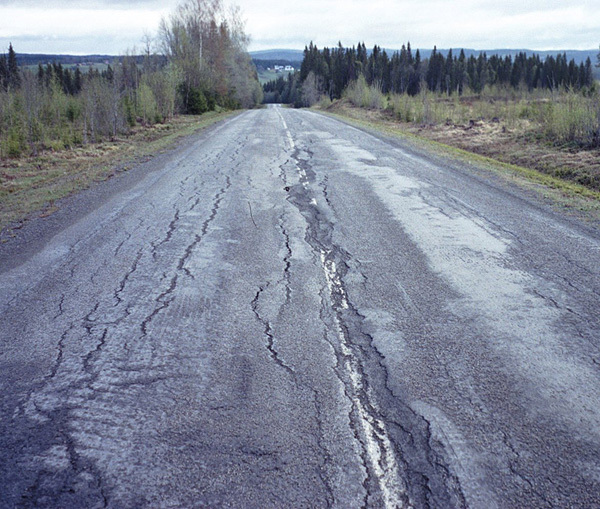 Soil replacement should be considered/used where a road is suffering from differential frost heave, as well as permanent deformation, and where there would be major problems in raising the grade line. 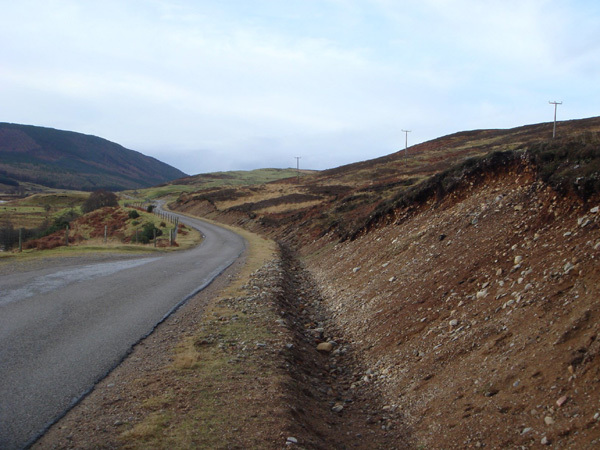 The technique is particularly suitable for problems located within road cuts, or moraine hummocks. Animation showing the principles of the soil replacement method. 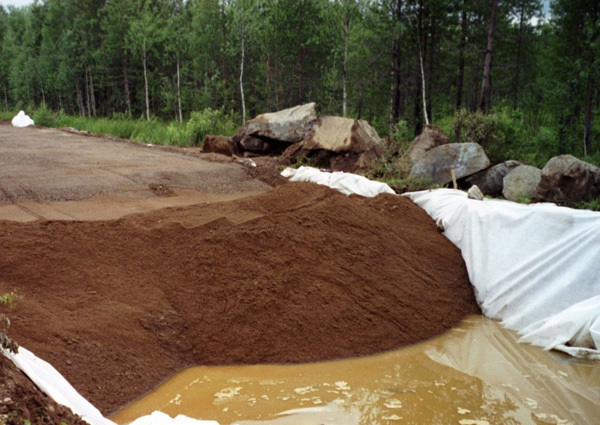 Soil replacement can also be used where the subgrade contains large boulders. 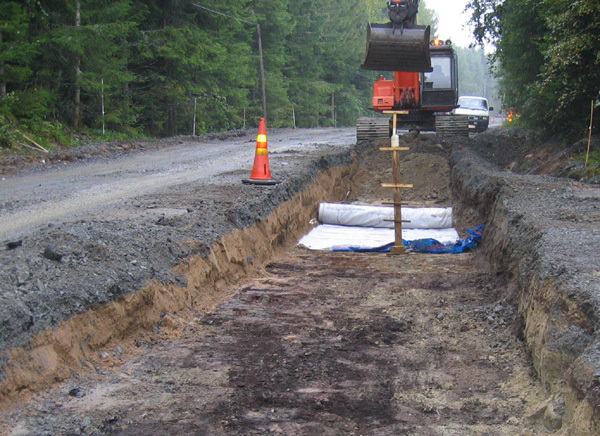 Shallow soil replacement with steel reinforcement can be used where the subgrade soil is compressible peat. 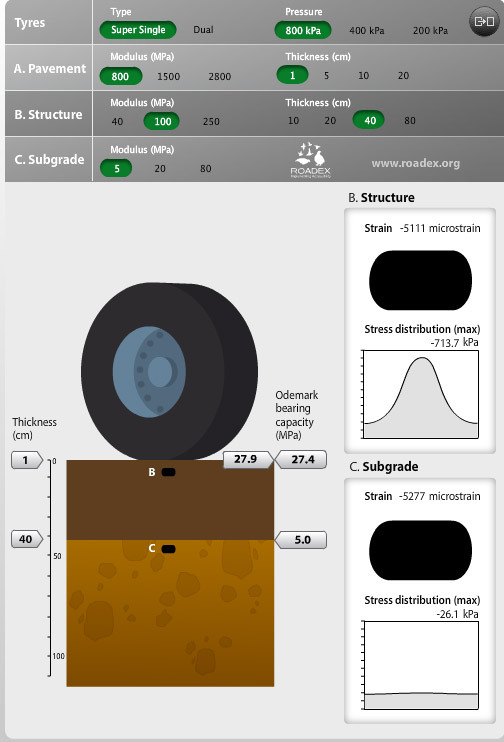 Animation showing the principles of shallow soil replacement with a steel grid. 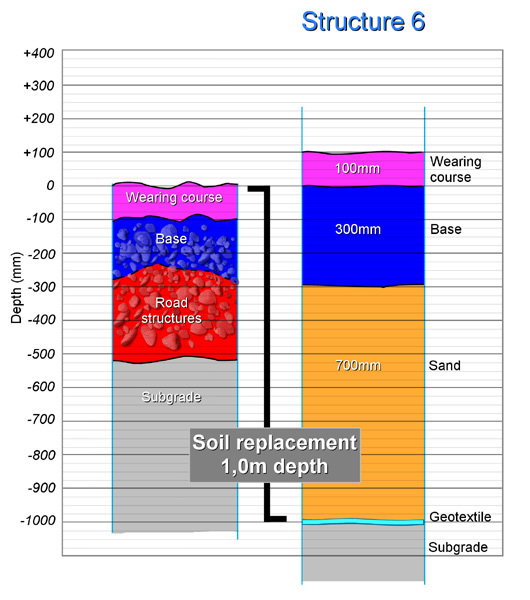 Transition wedge structures should be always used when making soil replacement structures. 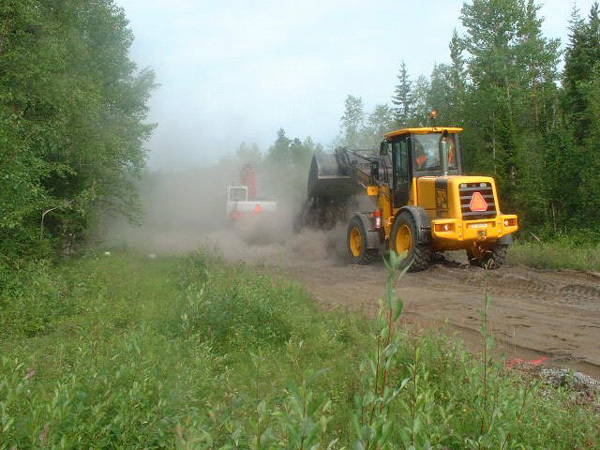 Thick soil replacement is seldom an economical solution on low volume gravel or forest roads. It can however be effective where bedrock is located close to the road surface. In these cases it is recommended that the soil should be replaced with frost resistant and water permeable material. Soil replacement is not the most appropriate rehabilitation measure for those locations where bedrock is blocking water. In these cases, breaking out the bedrock should be considered, or the use of a structure containing frost insulation. Soil replacement is not a recommended solution where bedrock is blocking the groundwater flow. 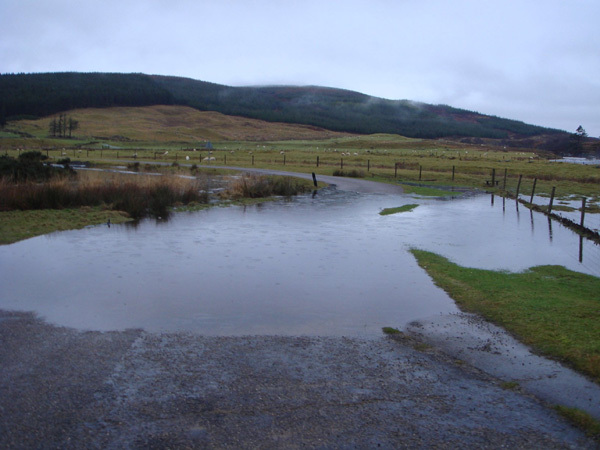 Possible solutions to this are to either improve the drainage in the upper ditch, or install a frost insulation structure to allow water flow under the road in winter. 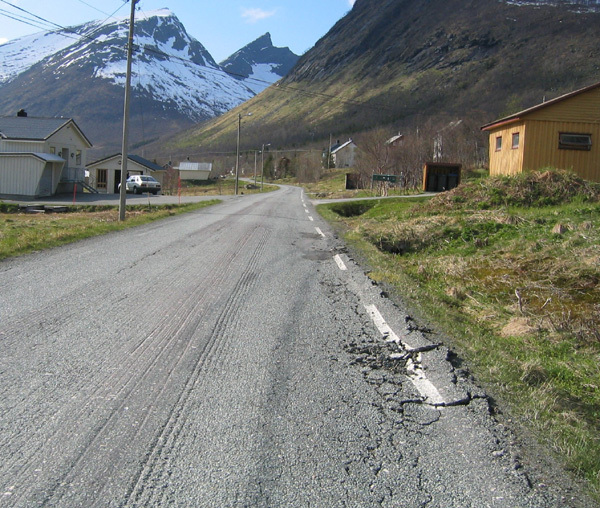 Deformation in road shoulders is a serious problem on the low volume road networks of the Northern Periphery. 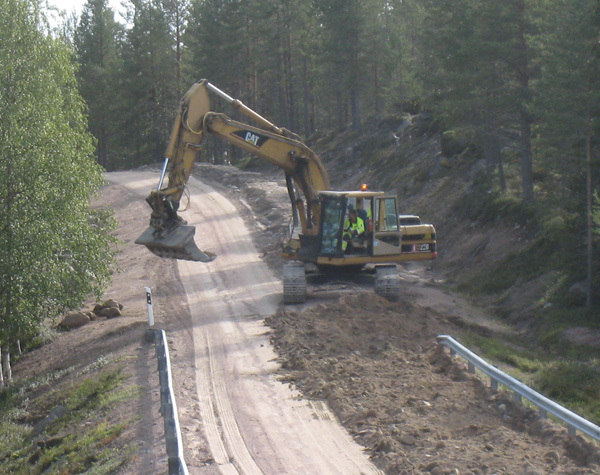 Strengthening of road shoulders and widening of roads require special design and construction techniques. 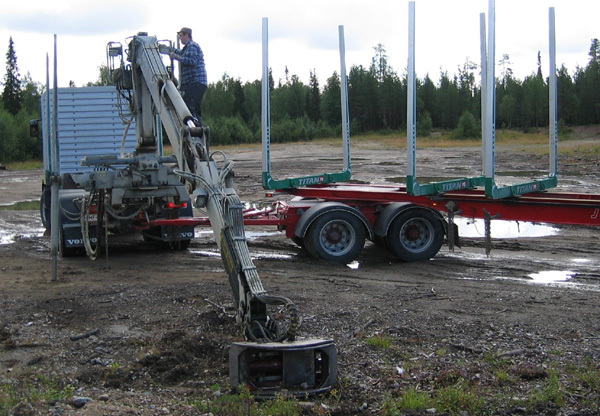 A range of activities were studied in a preliminary fashion in the ROADEX project but none were found that could be described as ‘well working solutions’. Other structures, that can be recommended under the heading of “special structures”, are frost insulation structures. 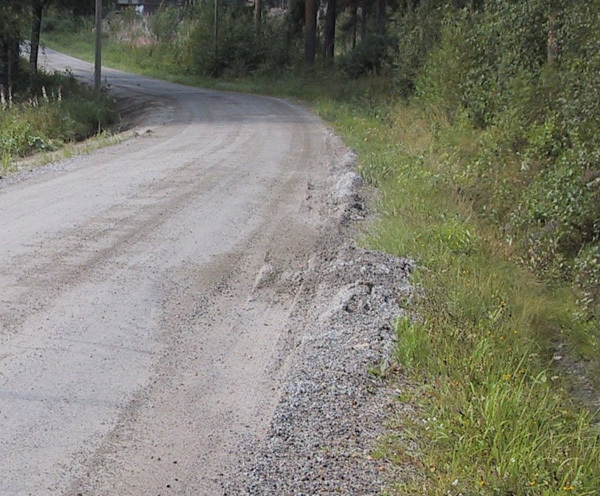 On low volume roads the idea is not so much to prevent frost heave, but rather to prevent the frost line penetrating too far down into the subgrade to block the groundwater flow. Insulation structures allow ground water to flow under the road and this can save expensive drainage solutions, especially on side sloping ground, where the bedrock is close to the surface. 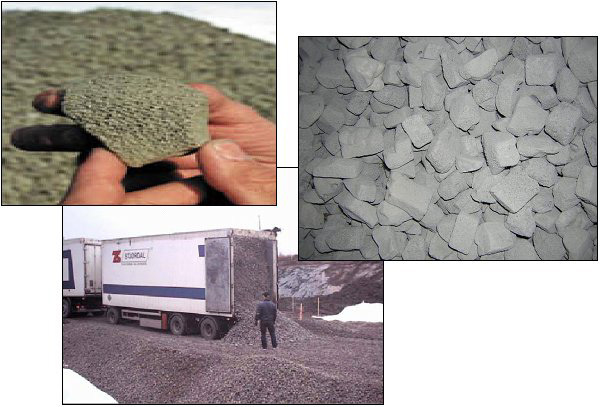 Insulation materials generally comprise the different types of polystyrene products and foamed class aggregate that has been successfully used in Norway..